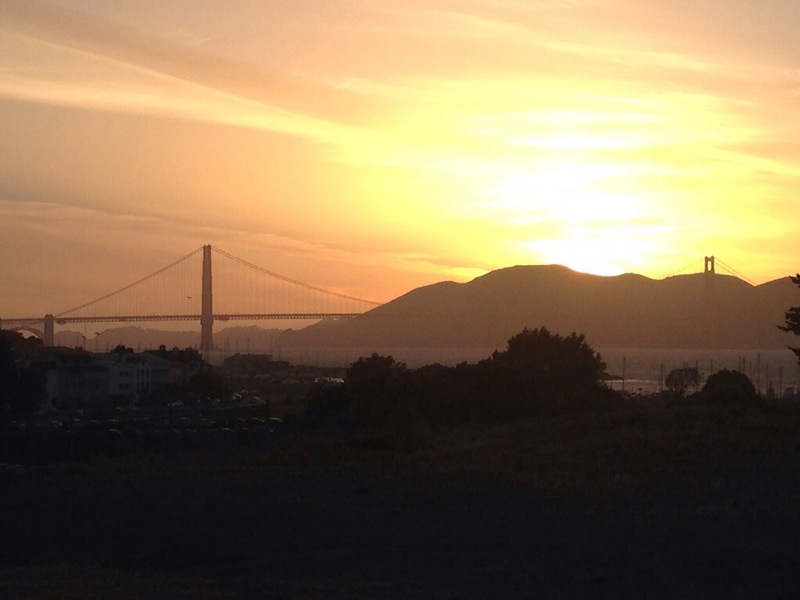 If I had to pick somewhere (outside London) to move tomorrow, it would be San Francisco. The weather is gorgeous, the bay is beautiful and their food and wine are world class. Given the quality of raw ingredients available, you actually have to try quite hard to eat a bad meal. 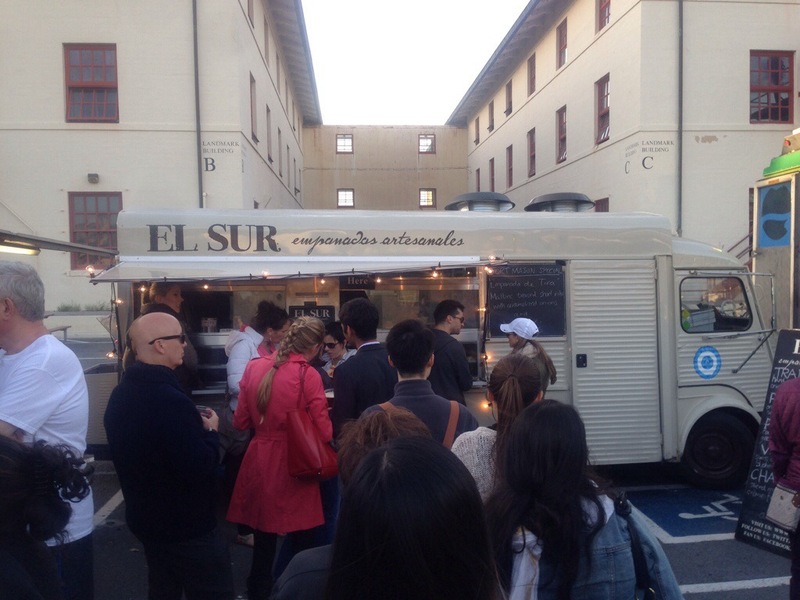 Street food has transformed the way we experience food both for the vendors and consumers. Whereas traditionally it would have taken huge amounts of capital to launch a restaurant, now it’s relatively cheap to buy a cart and get cooking. Similarly, a full restaurant meal is an expensive way for diners to try new things and experience the latest trends – a cheap, quick food stand is a much more democratic meal. 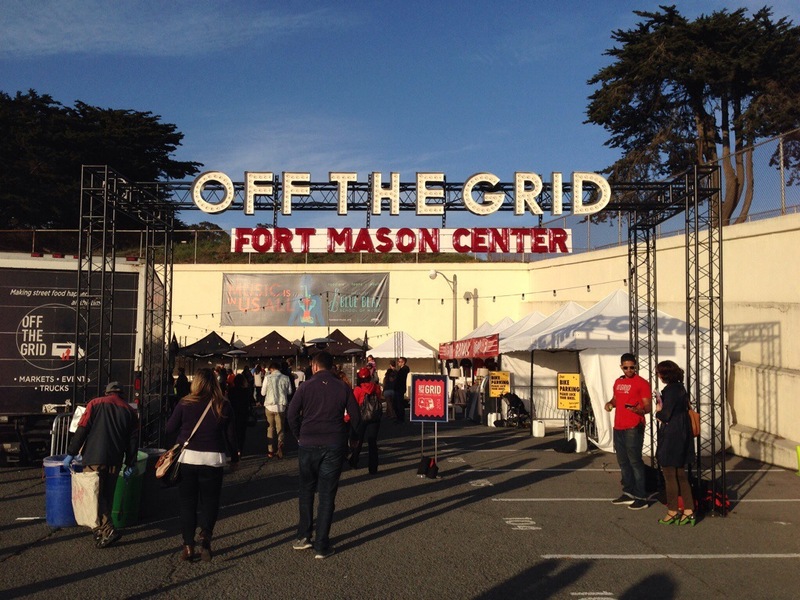 The only challenge is deciding what to have and Off The Grid make it that much more difficult. 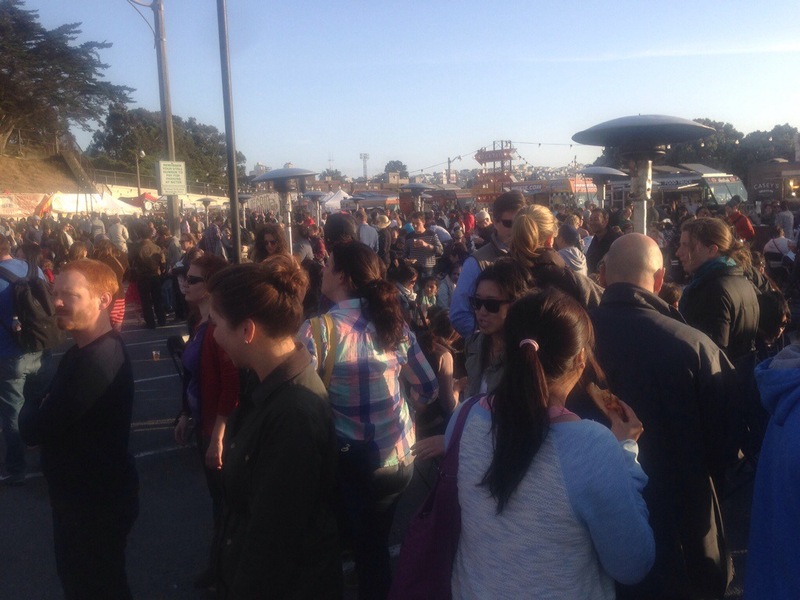 A joyous, weekly gathering of around thirty trucks, live DJs and views of the Golden Gate Bridge, it’s foodie paradise. Everything from confit duck to novelty candy floss is available – cheap, fast and fun. I shamelessly flocked to the most popular carts to see what San Francisco’s trucks had to offer. The Chairman serves wildly popular dumplings, people regularly queue for over forty minutes to sample their tender steamed pork buns or fun fusion sliders. It’s great food, small enough that you can eat more than one with cleverly balanced flavours – their pickles are heavenly. El Sur make empanadas – the South American pastry parcels I find vaguely reminiscent of a good cornish pasty. 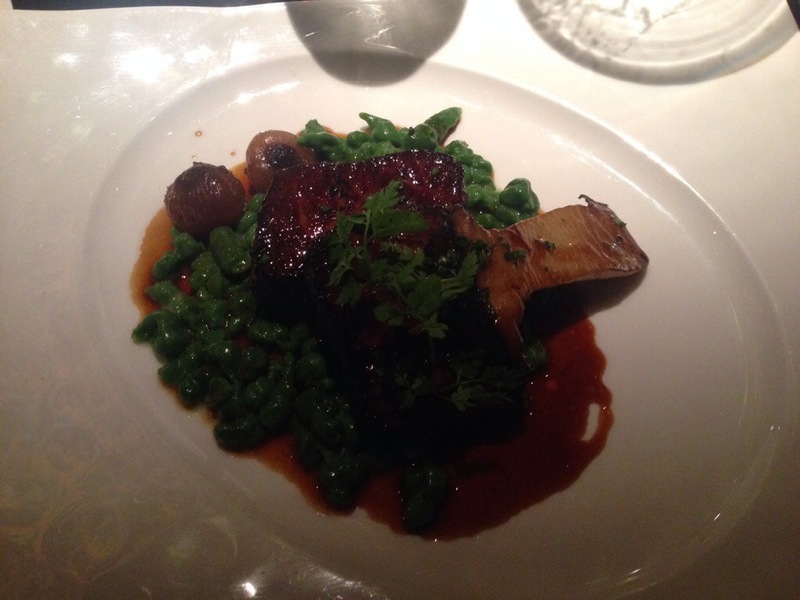 These were delicious, I chose the special – a slow-braised short-rib, with malbec and caramlised onion sauce. 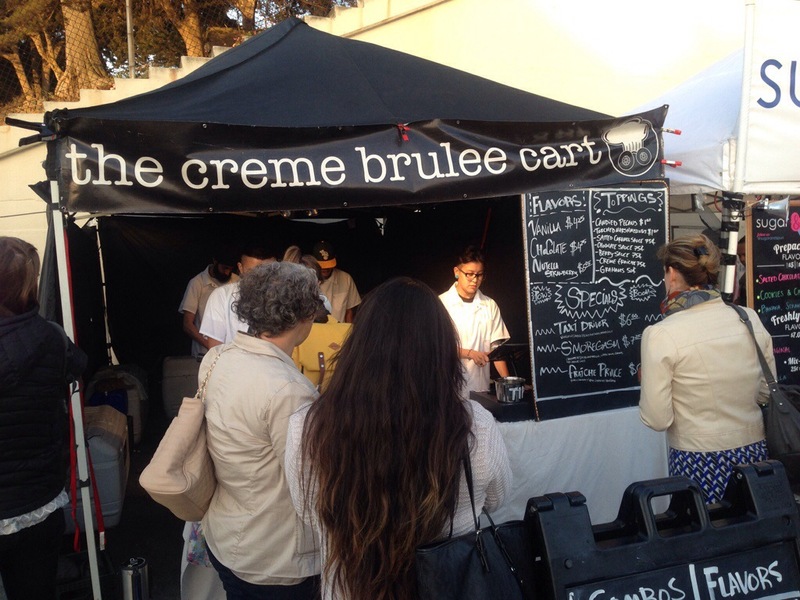 There were a huge range of dessert options – the Lonely Planet recommended “The Creme Brulee Cart”. A team of blow-torch wielding foodies re-inventing the classic french dessert for legions of adoring fans. I ordered their most popular special the, ahem, “s’moregasm”. 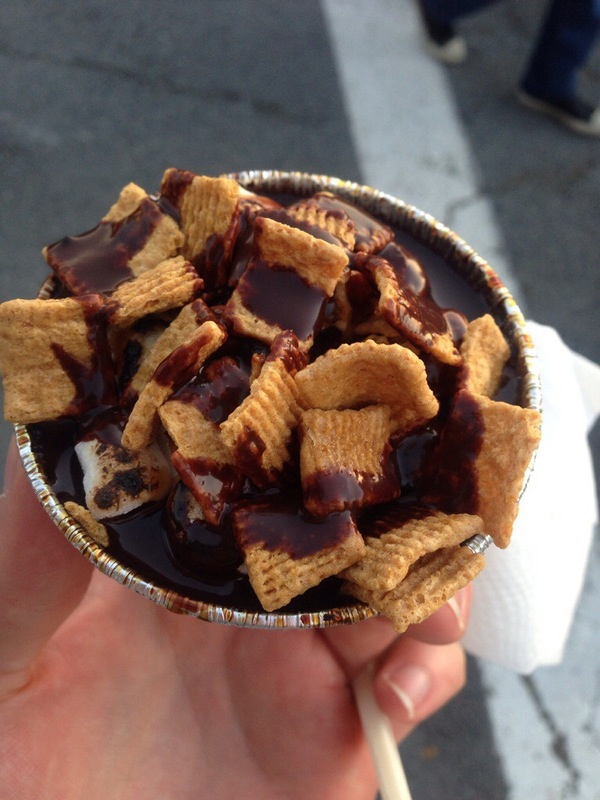 Based on the traditional campfire treat it’s got the normal ingredients (molten marshmallows and graham crackers) nestled on top of a chocolate custard. It’s incredibly good – just don’t expect to be able to eat it without liberally coating your face, clothes and innocent passers-by. 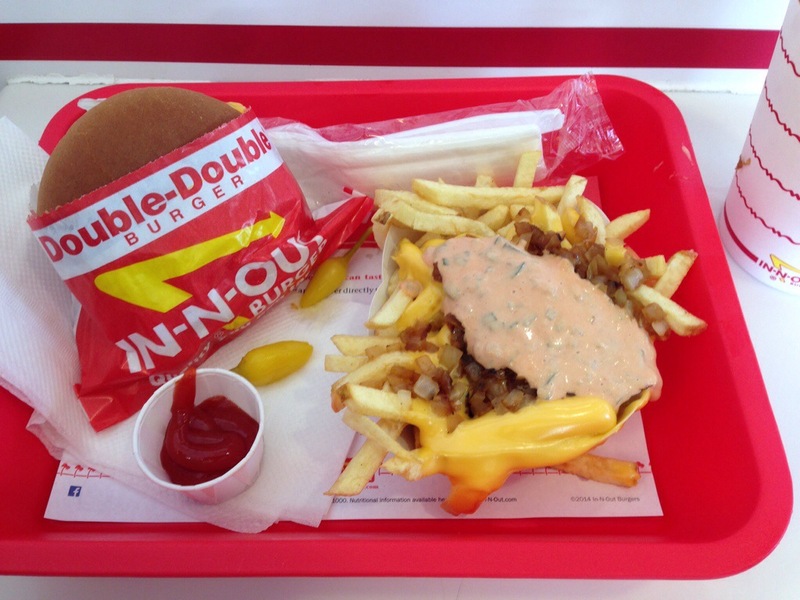 Most foodies have a guilty pleasure, but one that I don’t feel guilty about at all is In’n’Out. I’ve waxed lyrical about it before – it’s simple fries and burgers, freshly cooked by staff who are paid a living wage. Their not-so-secret menu lets you customise your burger in all sorts of exciting ways. It’s cheap, fun and makes me very, very happy. Rated as one of the best restaurants in the Bay Area, I was very lucky to snag a table at Gary Danko. 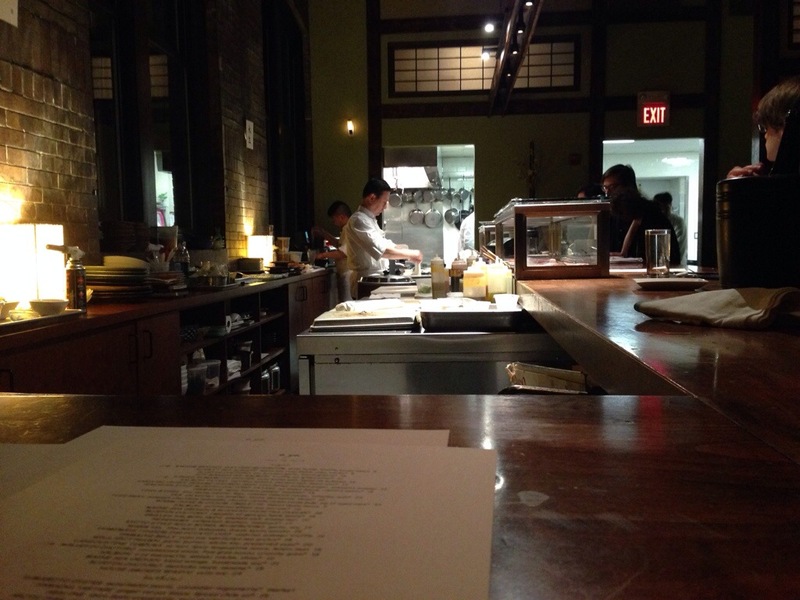 It’s classic fine dining: dimly lit room, plush linens and polished staff. Their menu is cunningly arranged into four broad sections – starters, fish, meat and dessert and you can pick three, four or five courses at a flat rate. It’s great fun to plan your own tasting menu and surprisingly difficult to narrow it down. 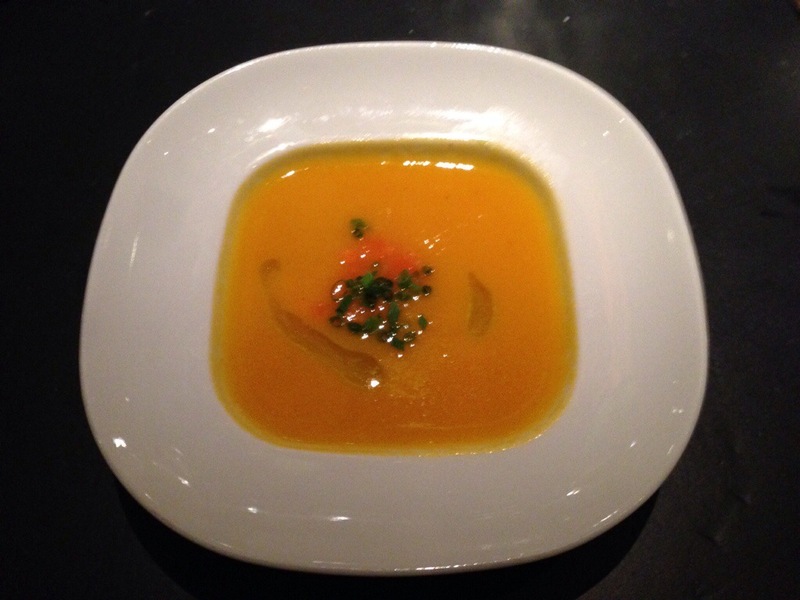 My meal started with an excellent martini and a simple amuse bouche of curried carrot soup. It was light, sweet and a nice way to setup the rest of the meal. 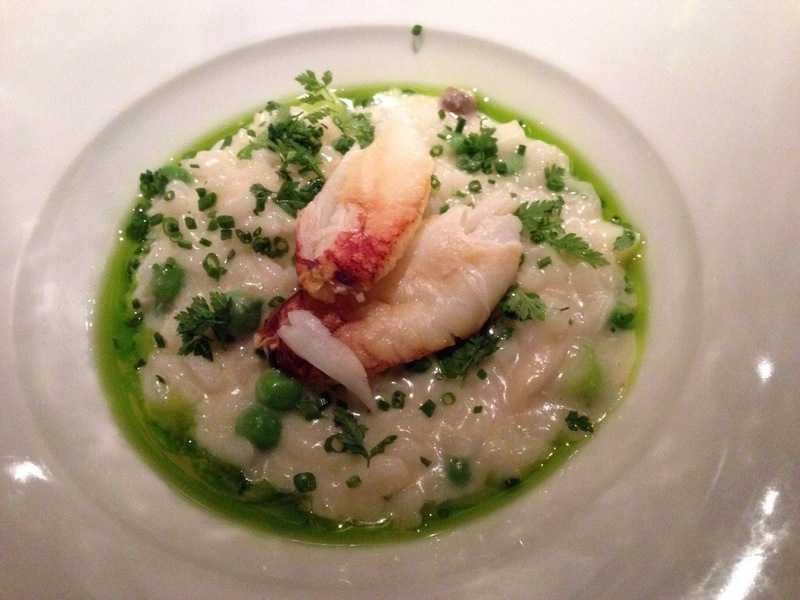 To start I had their Dungeness crab risotto – the rice perfectly cooked and the crab resting on a bed of other delicious seafood, dressed in basil oil. Risottos are rarely light, but this was like a delicate marine cloud. Fluffy, yet still having a little bite. My fish course was half a maine lobster on potato purée so delicate it’s practically a mousse, it really was stunning. The portion was generous and the flavours clean and refreshing, lovely stuff. 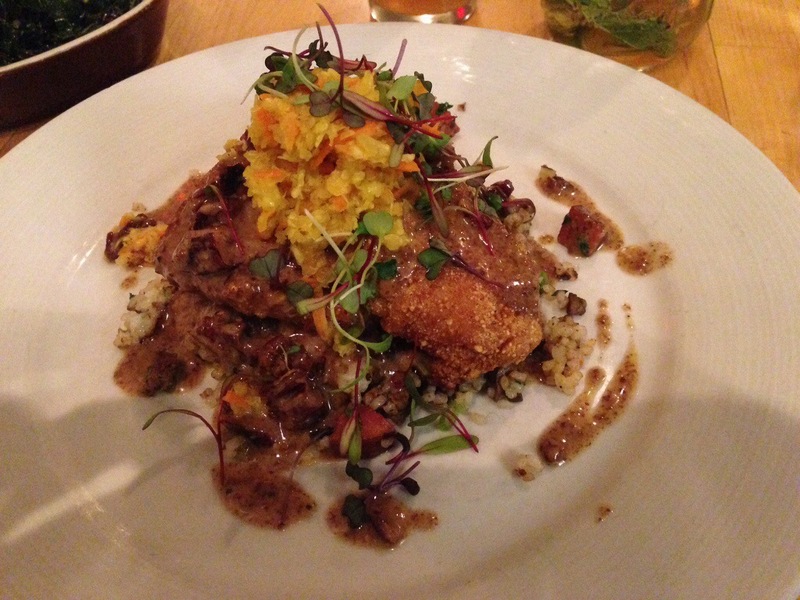 For my main I chose bison, served with a juniper berry crust, black trumpet mushroom and wild nettle spatzle. It was covered in the kind of rich, meaty reduction that has me mopping the plate clean with bread. The bison was a revelation – tender and strongly flavoured, perfectly matched with the sauce and a large glass of Zinfandel. Big, bold flavours – beautifully put together. Keen to sample more American delights I ordered the Louisiana butter cake for dessert. It’s a rich, dense sponge, vaguely reminiscent of an English suet pudding, but with a crispy sticky crust. It came with caramelised apples, huckleberry compote and the kind of ice cream that speaks of witchcraft (or more likely a well tended Pacojet). Incredibly smooth with a lovely, aromatic vanilla flavour. Some restaurants might give you a couple of chocolates or mints on the way out, Gary Danko give you a pastry symphony. 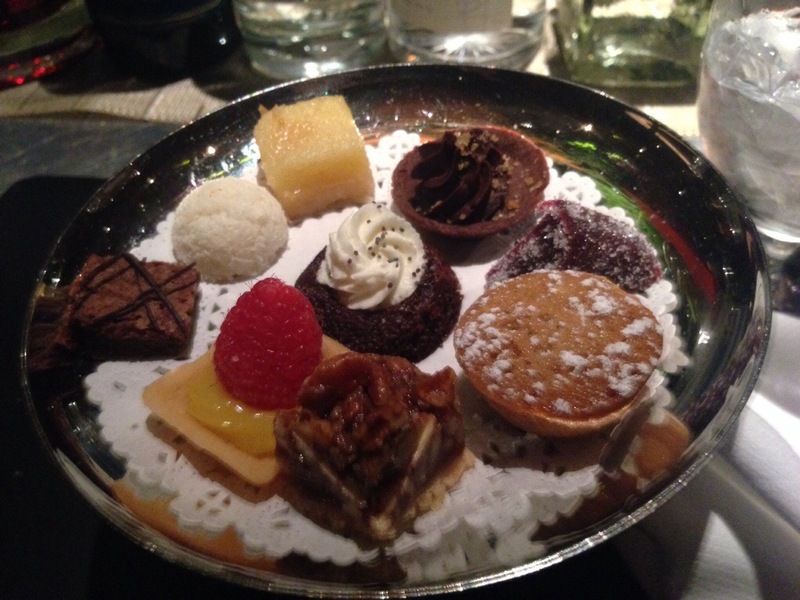 A plate of petit fours which give their dessert team a real chance to show off. Each miniature bite, from a sweet fruit jelly to a fluffy chocolate sponge was brilliant. I was stunned, it’s got to be one of the best meals of the last few years. I couldn’t fault it, from entering the restaurant to staggering happily out a few hours later it was just perfect. Wonderful atmosphere, great staff, stunning ingredients, precision cooking and real flair – it’s Californian cuisine at it’s best. When the free extras, quality of produce and standard of cooking are considered, it’s superb value for money. One Michelin star just isn’t enough. Peruvian food is taking the world by storm, it’s fresh flavours and simplicity are instantly likeable. 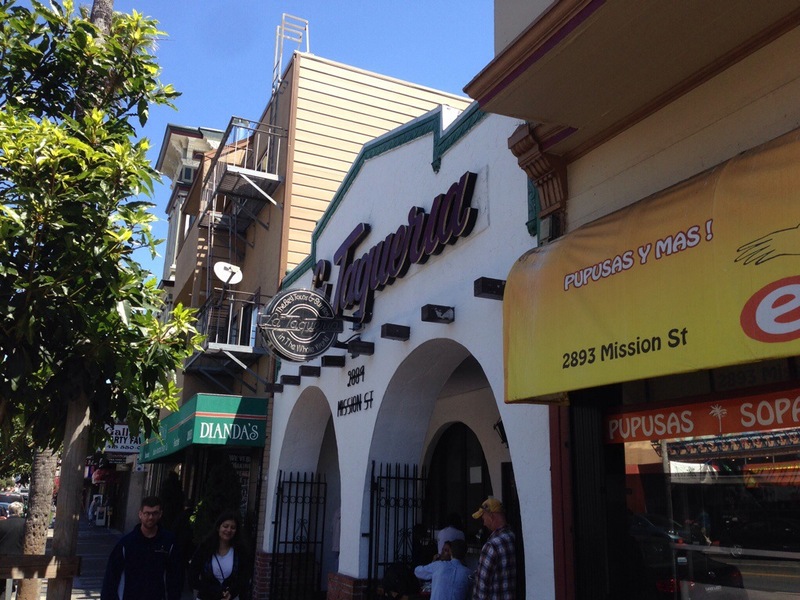 La Mar at the front of an impending wave of more affordable and family-friendly Peruvian restaurants. I was quickly seated and offered fried plantain and dips while I looked through their menu. While sipping on a lovely Pisco Sour I opted for a reasonably priced chef’s menu showcasing ceviche, seafood stew and their sorbets. Ceviche – raw fish that is briefly “cooked” using an acid (like lemon juice) is the flag bearer of Peruvian cuisine. It’s heavenly – sharp, sweet, textured and refreshing. Both of these were lovely, but I much preferred the classic ceviche over the tuna tartare – the potato and avocado mask the fish too much. The seafood stew was lovely – well cooked fish in a rich, almost Chinese sauce. Dessert were some lovely sorbets, light and refreshing. If you’ve never sampled Peruvian food, this is a great way to try a few dishes and see if you like it. 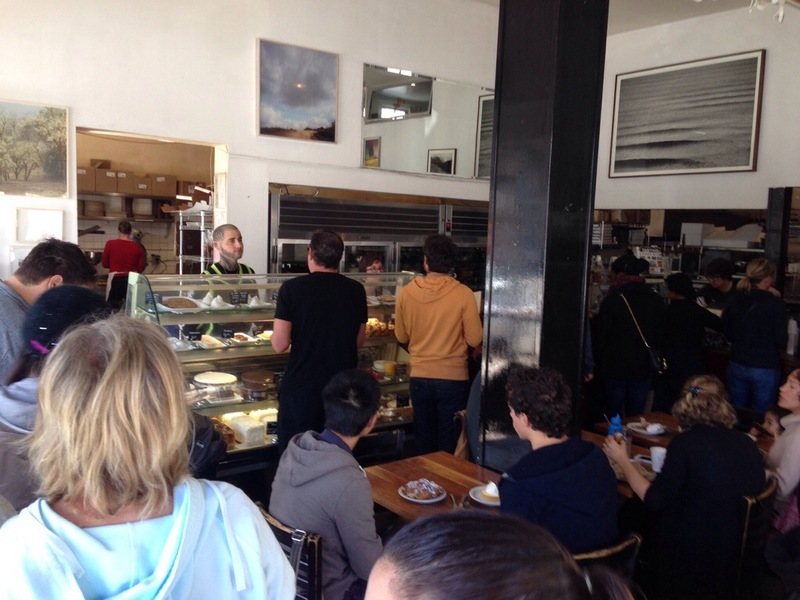 San Francisco has a real affection for brunch, and on a lazy Sunday morning the queue around the block for the best coffee and pastries. 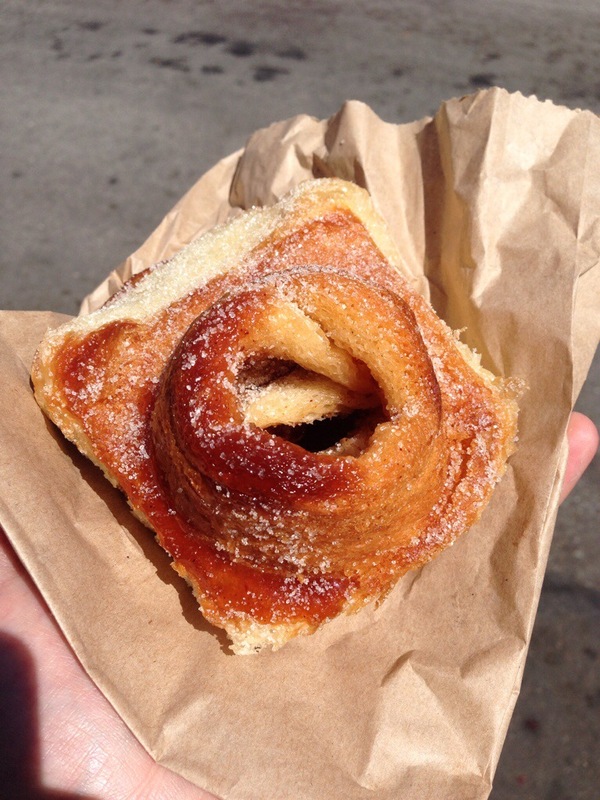 Tartine, in the lovely Mission district churns out the kind of morning treats that make you reconsider lunch. Their sugary morning roll was just delicious. Bi-Rite Market has been a San Francisco foodie icon for years, selling top quality produce and providing fabulous lunches. 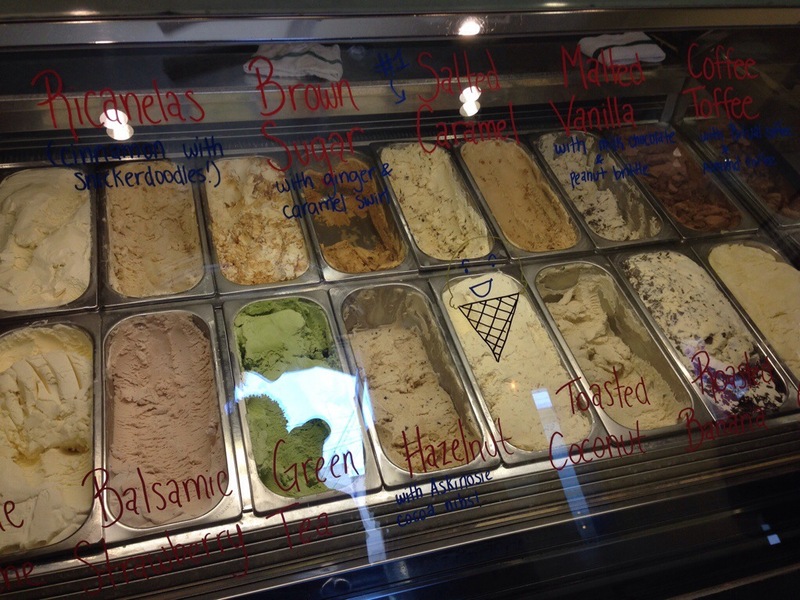 Over the road, their creamery serves up fantastic ice-cream with a range of home-made toppings. I went for their local chocolate and salted caramel flavours, drenched in hot fudge sauce. Magic. Starbucks are everywhere in America, but there’s a growing trend towards better coffee. Four Barrels are perfectly setup to meet this need, featuring freshly roasted coffee from some of the world’s top producers. They have an espresso bar producing all the standard drinks, as well as a special “slow coffee” section to show off their incredible products. Knowledgeable baristas will talk you through the different varieties available and expertly prepare them, all while giving you tips on where else to go in San Francisco for top eats. It’s everything a neighbourhood coffee shop should be. 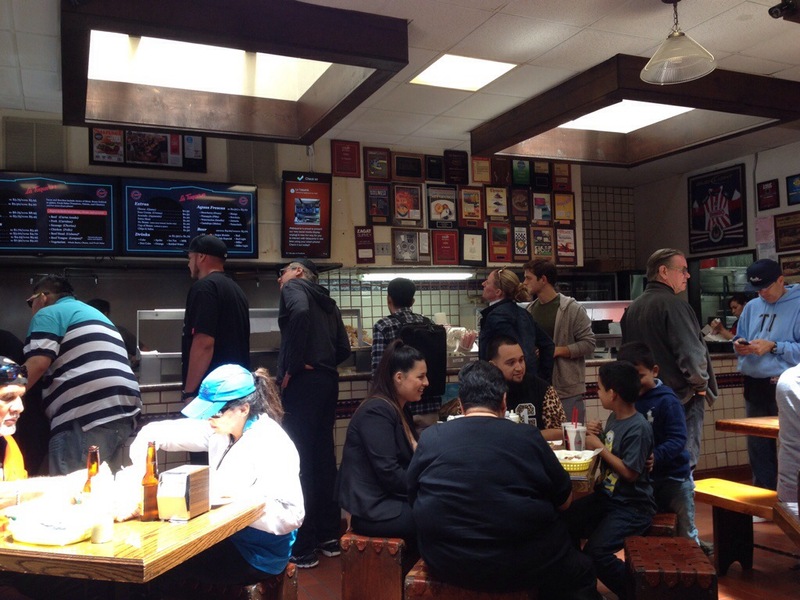 Surely one of San Francisco’s greatest inventions is the burrito. 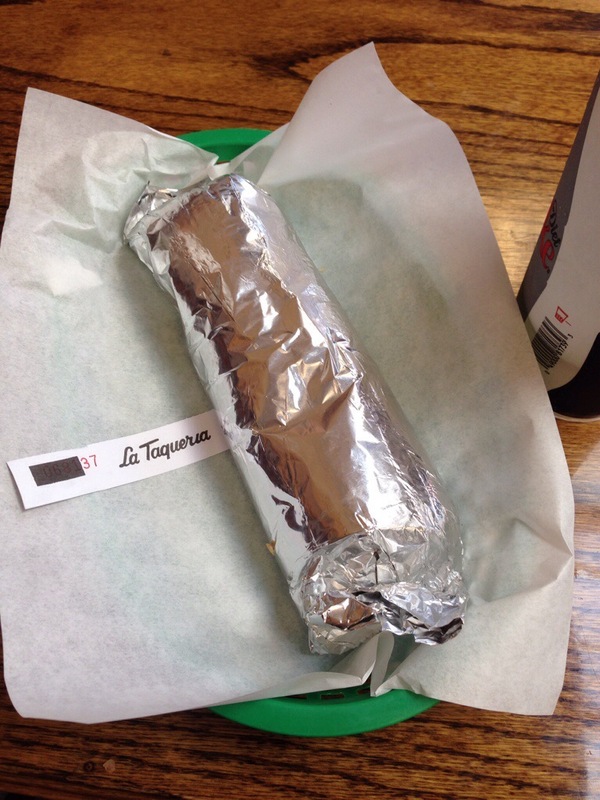 La Taqueria makes one of the best, using freshly cooked meat, hand chopped and bundled with the kind of salsa, avocado and beans that make you weep with pleasure. It’s so much better than some of the limp, stale efforts you see in the UK. Great ingredients, freshly prepared – it really is superb. Upmarket burgers are ten-a-penny in London. This humble American invention has taken over the high street with Byron and GBK providing mass-market appeal while Patty and Bun, Honest Burger and MEATLiquor making bloggers swoon. The same trend is evident on the other side of the pond – I‘ve visited Umami Burger before but was keen to see if it had changed in the last two years. The first thing that struck me was the menu – I liked the fact that they offered little tapas starters – it’s an unusual move for a ‘burger joint’, but it’s a really nice touch and something i’d like to see more of. There’s nothing complicated about throwing together a few little bites – but it really adds to the whole experience. The ‘devils on horseback’ were particularly good. Like any good burger place (see In’n’out for details) they let you muck with your chips. I chose to cover mine in an avalanche of pulled beef short-ribs and cheese. 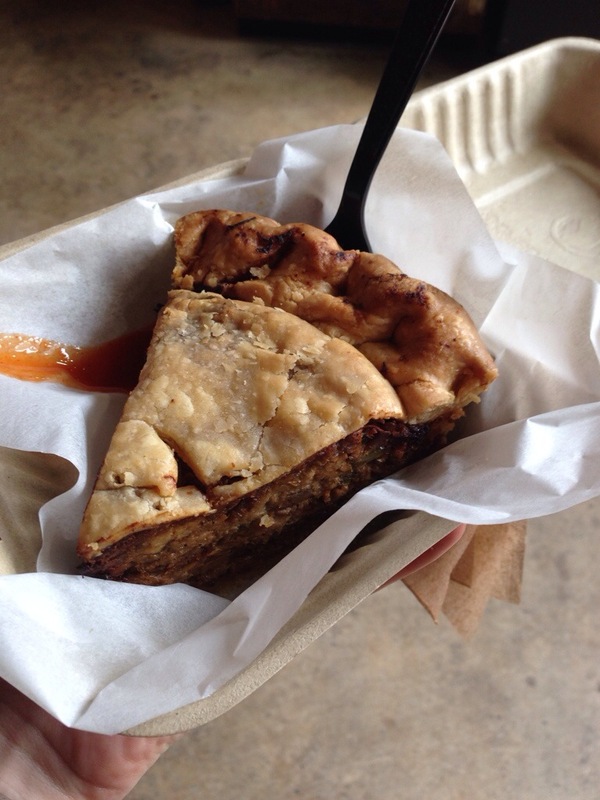 It was utterly delicious – rich, gooey and decadent. I spent a long time agonising over which burger to choose – I eventually opted for the special Jose Andres burger. Created by the star chef of Bazaar it’s patty is made from pork and cured ham, served with pepper confit, caramelised onion, manchego cheese and aioli. Rich, savoury and incredibly moist, this is a top burger – lets hope they follow Five Guys and Shake Shack to this side of the Atlantic soon! Thomas Keller is one of my culinary idols. The French Laundry, deep in the heart of wine country, is a landmark on the world food scene and one of the best restaurants in America. Unfortunately it has a price-tag and waiting list to match but luckily, he’s got a couple of other restaurants in Yountville and I was thrilled to go to Bouchon Bistro. It’s a little piece of Paris – smartly dressed waiters weave between closely packed, linen clad tables. There’s brass and banquettes, acres of marble and the kind of menu that makes you hum the Marseillaise. While we deliberated, some lovely bread turned up – shaped into an ear of wheat. Keller is equally famous for his bakeries (one of which is next door) and the bread is suitably brilliant. Sometimes, three courses aren’t enough. 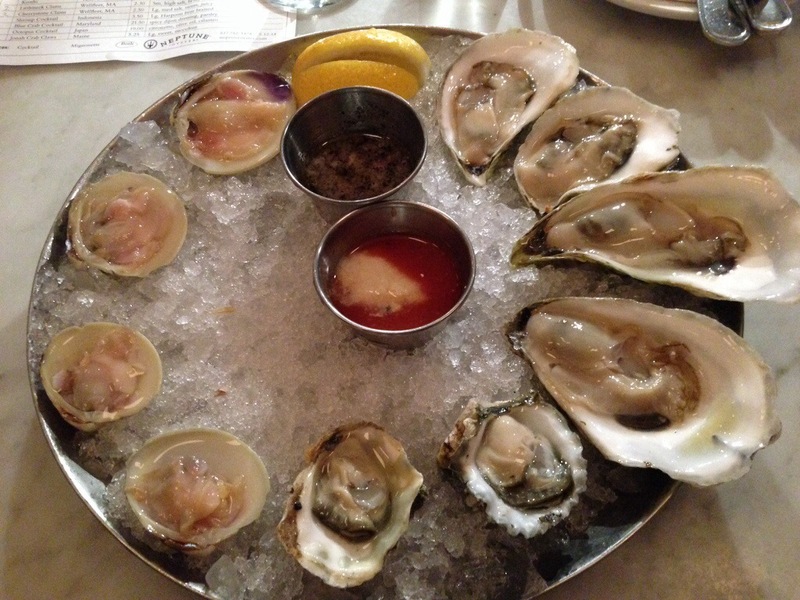 To kick things off we shared some lovely oysters – covering the spectrum from salty to sweet. Next up were some lovely Burgundian snails in rich garlic butter, covered with little puff pastry hats. These were beautifully cooked, even if I did find a tiny fragment of shell. For my main I had steak frites – a beautiful piece of beef, lovingly cooked, drenched in butter and served with fries dusted in enough truffle to make an accountant wince. In many dishes this would be overpowering – here it worked brilliantly. To finish the meal – a trio of excellent brownies and some great ice cream. Rich, chocolatey and utterly delicious. I adored the set chocolate foam – the world’s most sophisticated Aero! Bouchon Bistro is the perfect example of a restaurant doing something specific, incredibly well – it doesn’t try for modernist touches or strange ‘fusions’. 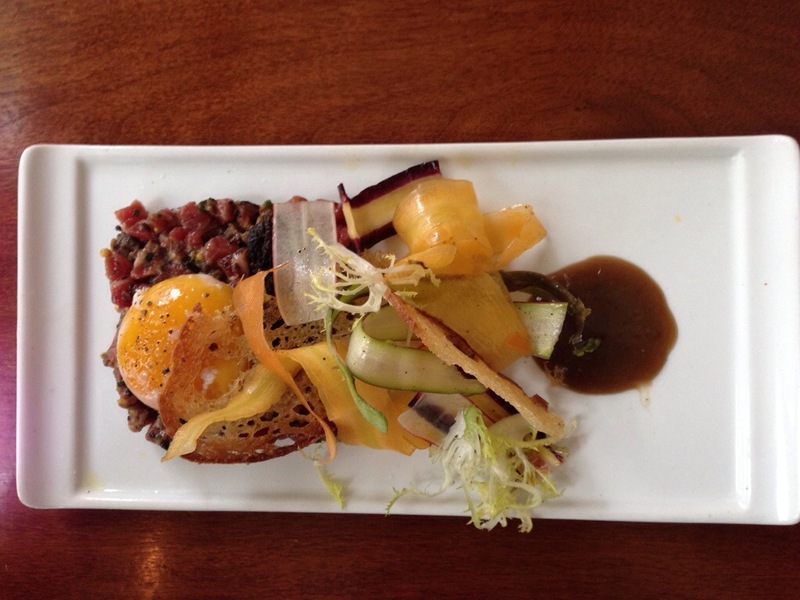 It’s rustic French food, classically cooked and thoughtfully presented. 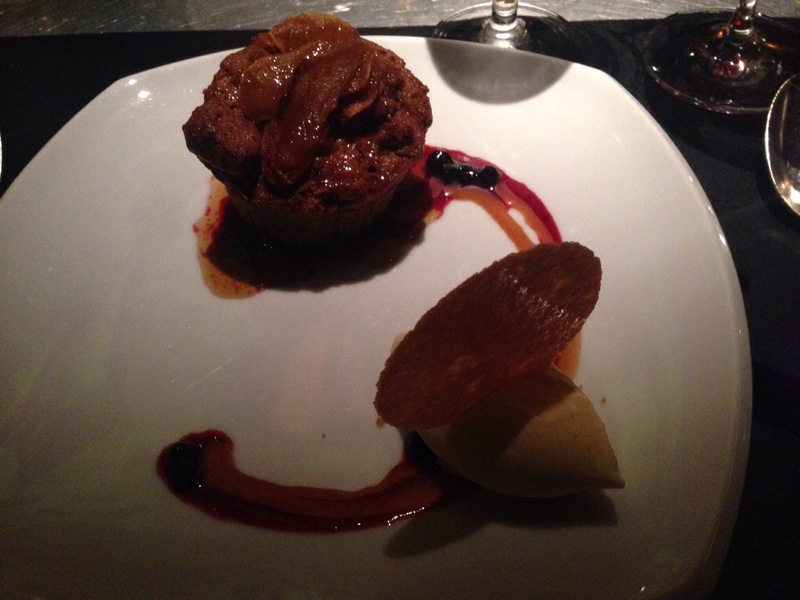 It was a wonderful meal – the French Laundry will have to wait until next time! Chicago is a stunning American city. On the shores of Lake Michigan it boasts an incredible art collection, amazing architecture and some superb food. 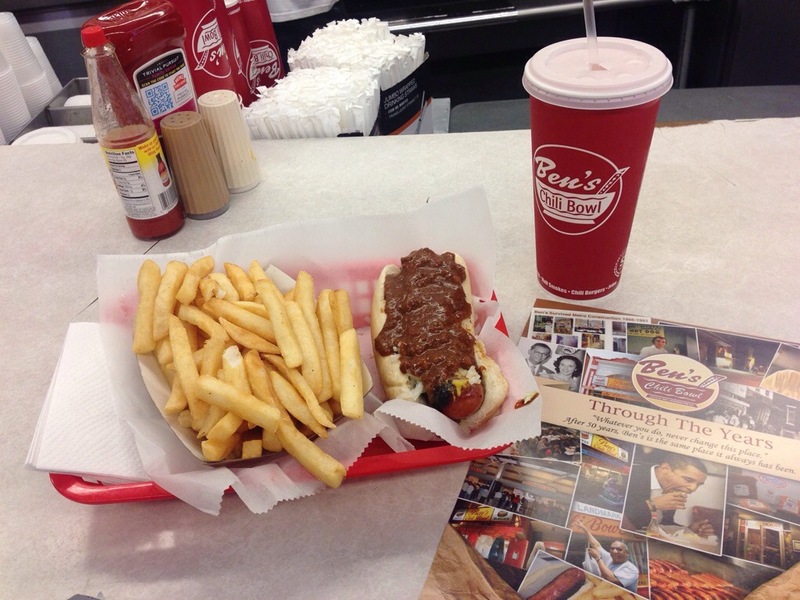 Locals lay claim to three specific specialities – deep-dish pizza, chicago-style hotdogs and Italian beef sandwiches. I set out to try all three, as well as sampling some of their other culinary delights. In Chicago pizza is taken very, very seriously. This is not the wafer thin authentic crust of Neapolitan fame – Chicago “deep dish” pizzas are cooked in special pans which allow them to be as much as two inches thick. The crust is much closer to pastry in texture and the fillings nestle under a mound of molten cheese and sweet tomato sauce. The location of the best pizza is hotly debated, but the ever reliable Lonely Planet plumped for Giordanos. Fresh from the airport is seemed the perfect way to get to know the city. They make most of the pizzas fresh, which is great – provided you don’t mind the 40 minute wait. The end result is a heart attack on a plate. It’s certainly not haute cuisine but it is incredibly filling and you can’t help but smile as stringy molten cheese goes everywhere – it’s fast food at its fun and tactile best. The Italian beef sandwich is a simple thing – roasted beef, with Italian herbs and peppers served in a white roll. Each element is obsessed over: the beef must be wafer thin, the herbs have to be just so and the bread needs to be firm enough. The key element is the traditional “dip” where the assembled sandwich is unceremoniously plunged into the gravy – turning the bread into a delicious, if unstable, platform. Just outside the loop, Al’s is one of the main contenders for the title of best beef sandwich and a healthy crowd of locals seem to agree. The sandwich itself has a reassuring weight. The beef is very tender and the copious amounts of gravy stop it drying out. It’s rich, savoury and very tender. 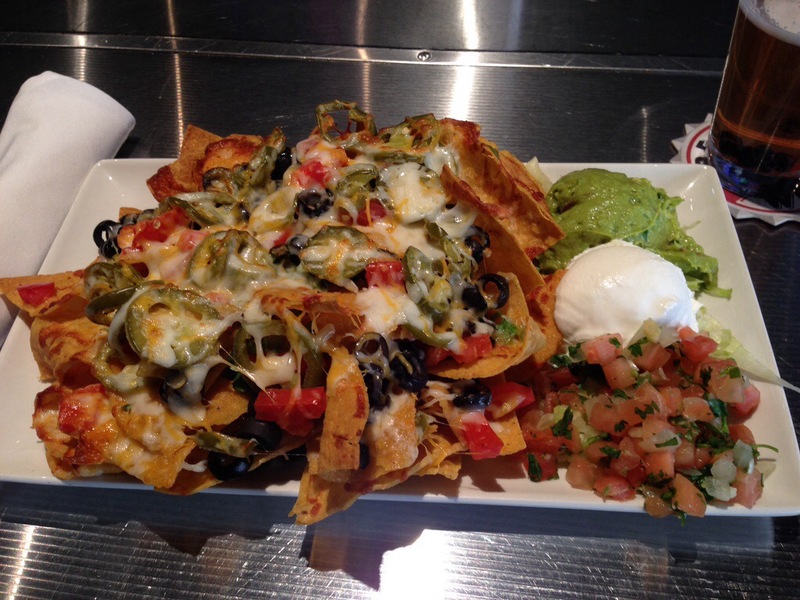 The perfect mid-week lunch – if you don’t mind the almost inevitable collateral damage to your shirt. Getting messy is half the fun! A few things mark out a Chicago hot dog – namely the sesame seed bun, a wide variety of pickles and onions on top and the total absence of ketchup. I was pointed in the direction of Portillos and was met by a reassuring wall of hungry customers. The sausage itself is very traditional, finely minced beef in a snappy, natural caseing. To a British palette it can taste a little over-processed, but Portillos blend is custom made and is much better than the average kerb-side vendor. It’s a good hot-dog and I liked the extra toppings – would a little ketchup really be that horrendous? They’re also known for their chocolate cake – always eager to suffer for my art I picked up an enormous slab. It’s actually incredibly light, I comfortably demolished a huge piece after a sizeable lunch. They’ve done something clever with the batter, possibly folding in whipped egg whites. It’s really good! The railroads once transported most of America’s beef through Chicago. Consequently there’s a slew of steakhouses – after a fair amount of research online I chose David Burke’s Primehouse, primarily on the strength of their ageing process. They have a patent on the use of Himalayan rock salt in dry ageing steaks, which they do for up to 75 days. Situated in the James hotel, the dining room is warm and inviting and the staff quickly had me ensconced at a leather clad table with an excellent cocktail. Instead of bread they provide “popovers” (Yorkshire puddings) – it’s a lighter, beefier, alternative. The menu is designed around the steak with some really fun touches. To start I had “surf and turf” dumplings. These came as four Chinese-style dumpling lollipops – little bits of short-rib and lobster with a simple sauce. It’s a really clever way of serving them and ensures you have enough room for the main event. On the waiters recommendation I went for the fifty-five day ribeye. The steak itself was sizeable and perfectly cooked, a thick crunchy crust giving way to a blushing pink middle. It had just a hint of the blue-cheese flavour you get with seriously old beef and the texture was excellent – the fat just melting in your mouth. They brush the steaks with hot, aged, suet to add extra beefiness. As with most American steaks – it did lack that rich, savoury note you get from the best British cattle. 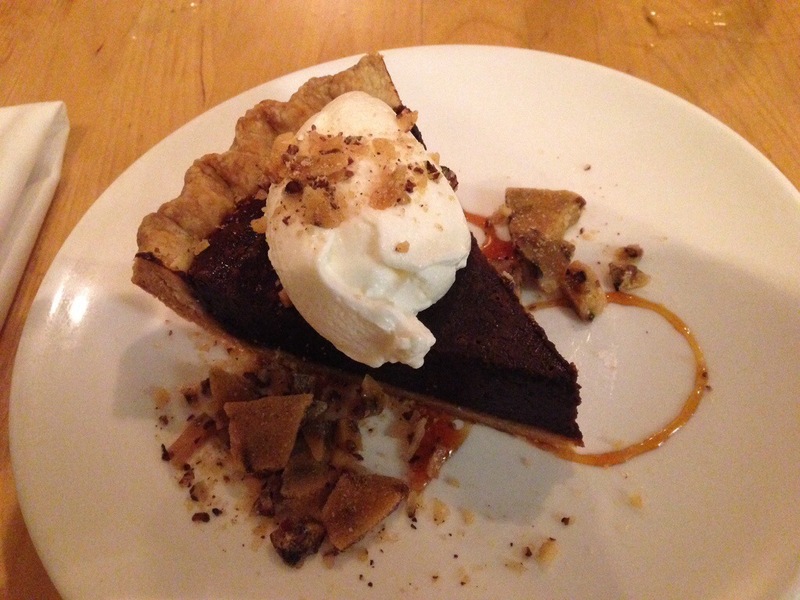 To any Americans who doubt it – take a trip to Hawksmoor in London and thank me later. Alongside the steak I had some good truffled fries – interestingly they’d grated asiago (an Italian hard cheese) over the top. The strong umami savouriness works really well with the beef – I’m definitely stealing that idea! Dessert was just brilliant – mini doughnuts which you get to fill at the table. The waiter provided three small bottles of sauce – vanilla, caramel and apple/ginger. You simply spike the doughnut with the nozzle and squeeze. It’s great fun and would be perfect for a dinner party, another great concept I’m taking home. It was a lovely meal, but I can’t get away from the feeling that if you’re going to pay top dollar for steak, it really needs to be outstanding. British beef just has more flavour. That said – their starters and desserts were excellent and certainly more fun than a “traditional” steakhouse experience. I don’t normally blog about my hotels, but the Palmer House deserves special mention as it gave the world a truly wonderful gift – the brownie. Developed for the Worlds Fair in 1896 it was meant to be more portable than a conventional cake, perfect for a lady’s lunchbox. The hotel still makes brownies to that same recipe, though they have tarted up the presentation a bit. Served with a stout gelato and a milk chocolate mousse it’s a lovely dessert. The brownie is surprisingly dense, definitely at the fudgey end of the spectrum but with a really good bitter chocolate kick. The recipe calls for a walnut and apricot jam topping, and very nice it is too. Milk is a classic accompaniment and serving it as a mousse adds lightness whereas the sharp, beery ice cream helps cut through the richness. A Chicago icon situated near the original start of Route 66, Lou Mitchell’s is the quintessential American diner. Friendly staff serve bottomless coffees and enormous breakfasts while locals chat about last night’s sport. I had a very nice waffle with fruit and a side of bacon. It’s never going to win awards, but it’s cheap, filling and on a wet Chicago morning, the perfect way to start your day. It’s not uncommon to be innocently strolling around Chicago, admiring the architecture and be suddenly hit with the wonderful smell of hot caramel. Garrett popcorn shops are everywhere and wildly popular. 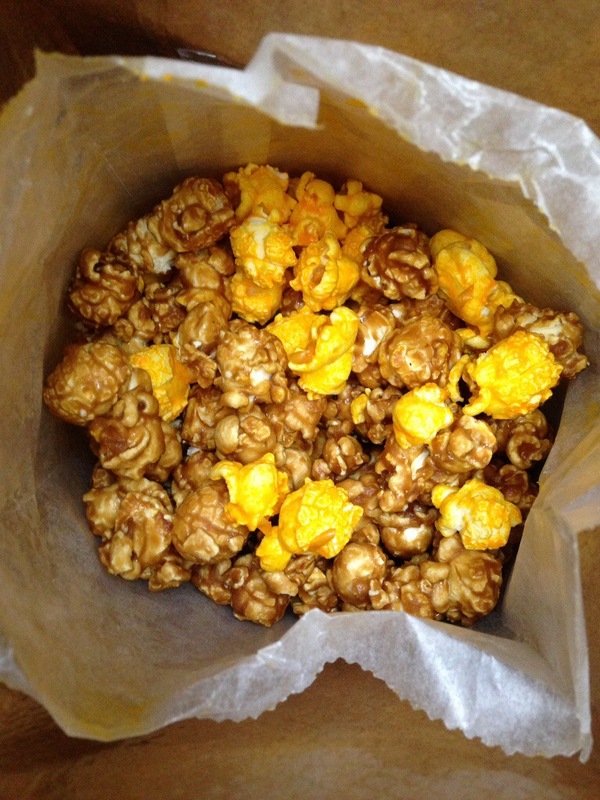 They do a variety of flavours but the local favourite is a “Chicago mix” – half caramel and half cheese. I was initially sceptical but it does grow on you. A ‘small’ bag is simply enormous and kept me going on the long flight to the West Coast. Boston is the birthplace of modern America. It’s stuffed full of historical sites and monuments to their fight for freedom. Like the rest of America it’s a real mix with strong Irish, Italian and Asian influences. Migrants brought their recipes with them and used the fantastic ingredients they found. On the edge of Cambridge, the university suburb which is home to MIT and Harvard, Hungry Mother serves traditional southern fare with a modern twist. The restaurant is in a converted house, with lots of little rooms and corners to tuck tables in. 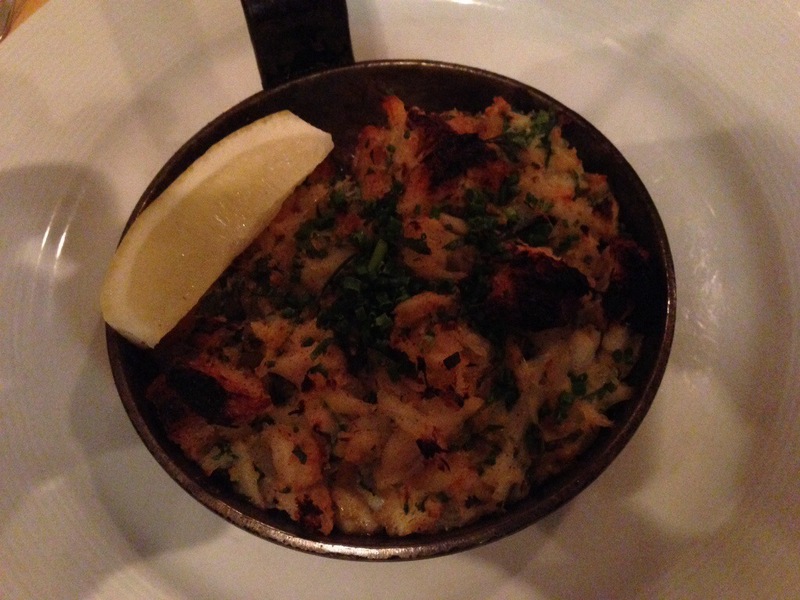 I had a delicious devilled crab starter – huge chunks of fleshy crabmeat, spicey rice and a lovely spiced sauce. It was elegant in its simplicity. Next up was some fried catfish in a cornbread crumb with andouille sausage and a side of collard greens. The fish was beautiful, just cooked and wonderfully crunchy – the best fish finger ever! The sausage added some really nice spice to the dish. 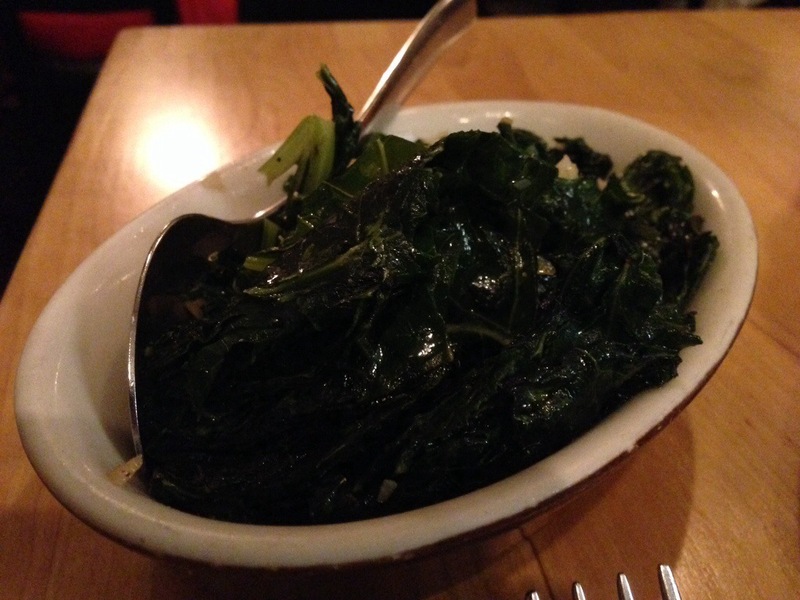 I was blown away by the greens – rich, garlicky and with little crunchy almond pieces. I could have eaten a bucket of the stuff. Desert was a chocolate chess cake – thick, gooey chocolate ganache on crumbly pastry with a good ice cream to cut through the richness, very nice! 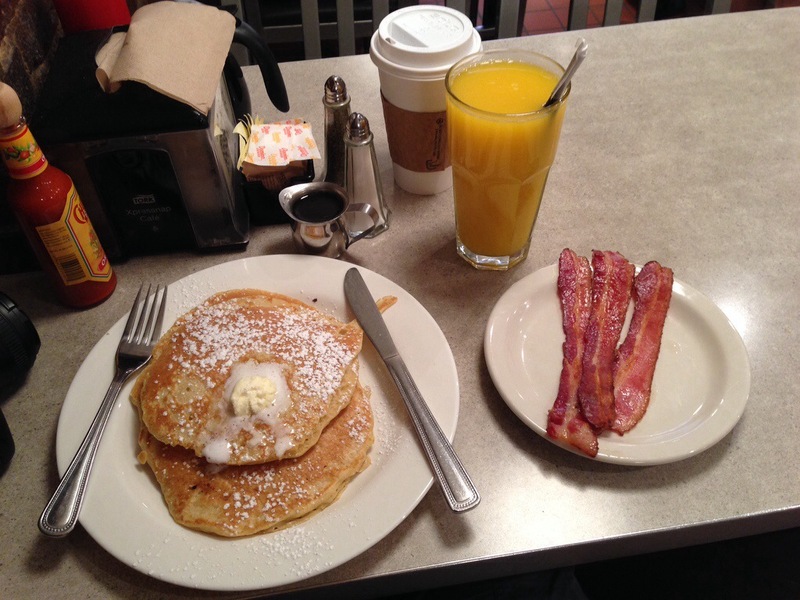 Diners are a staple of American life – like greasy spoons in the UK, they provide cheap, friendly meals for the masses. The Paramount, just off Boston Common has been serving patrons for decades. They operate an unusual service model where you place your order directly with the chefs, pay the waiters and then collect your food at the till. My pancakes with a side of bacon were delicious, I particularly liked that they offer a really good Vermont maple syrup with it, rather than the artificial stuff you normally see on diner counters. Barbecue is traditionally a mans game – there’s something primordial about smoke, wood, fire and meat. Women are starting to make inroads and when I spotted one of the food trucks leading the charge in Charlestown I had to have a sample. The ribs were superb, dry smoked with heaps of flavour and just the right texture. A fluffy cornbread muffin topped it off. As the American love affair with craft beer continues, brewpubs are popping up all over the place. The Boston Beer Works is next to the TD Arena, home to the Boston Bruins. I popped in for a pint of their speciality Bluebeery Ale. 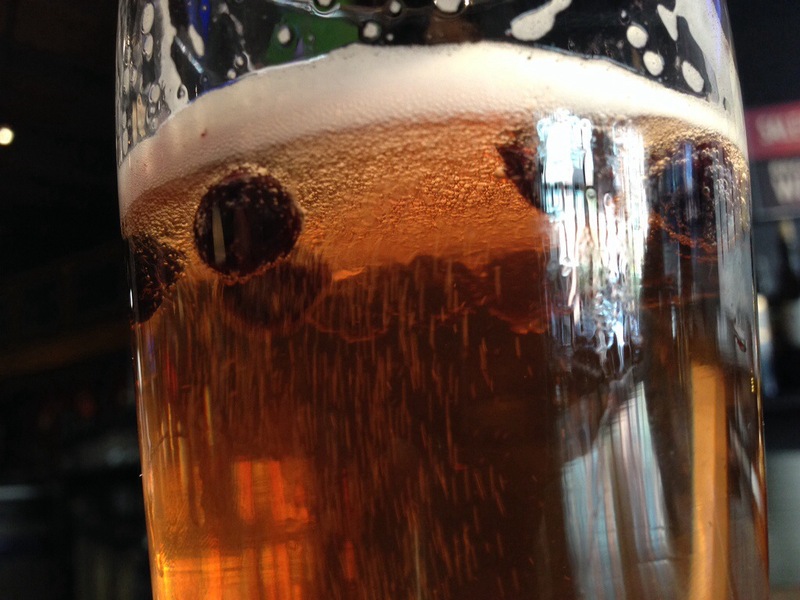 They use blueberry juice in the brew and serve it with a handful of fruit, which bob mesmerisingly in the bubbles. It’s a lovely, light summery beer. 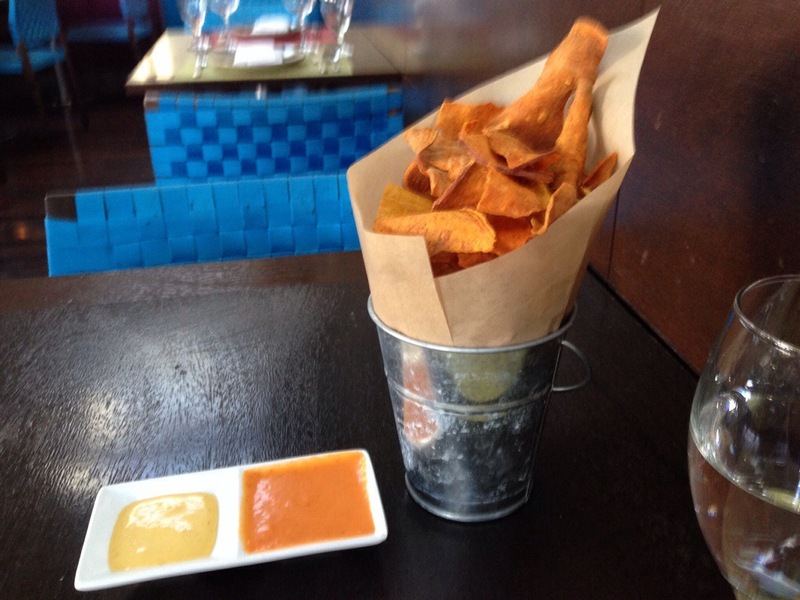 I ago ordered a half portion of nachoes – what arrived can be best described as a bath tub. 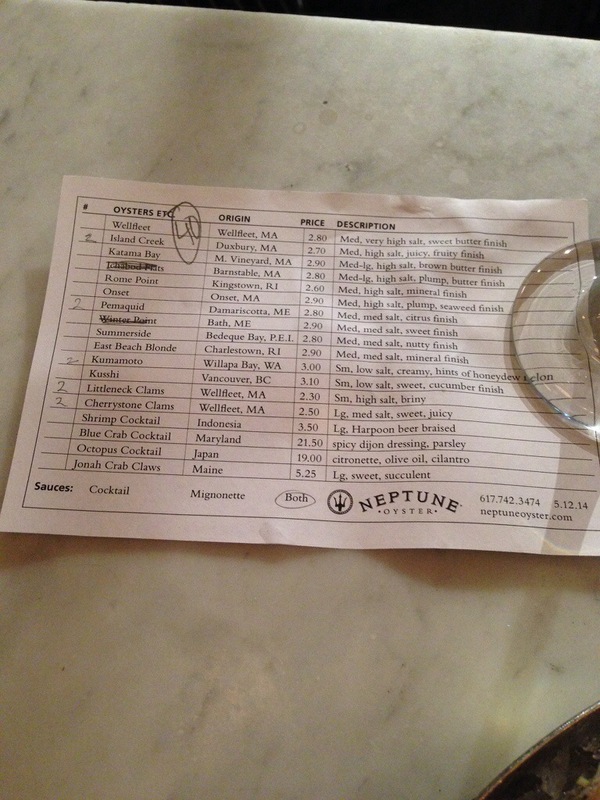 Boston has excellent seafood – one of the most popular places to sample it is Neptune Oyster Bar. 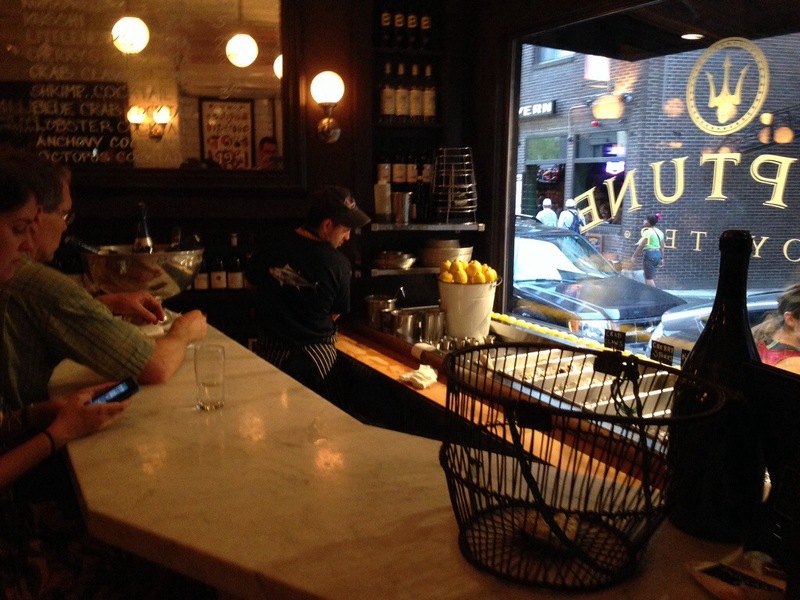 Situated on the edge of the Italian North End, locals will wait over two hours for a table. I managed to squeeze in early one Monday evening to see what the fuss is about. They offer a huge range of oysters, each described in terms of size, saltiness and finish. Sampling a range, I loved the melon sweet Kumo-moto and the salty, citrus Pemaquids. 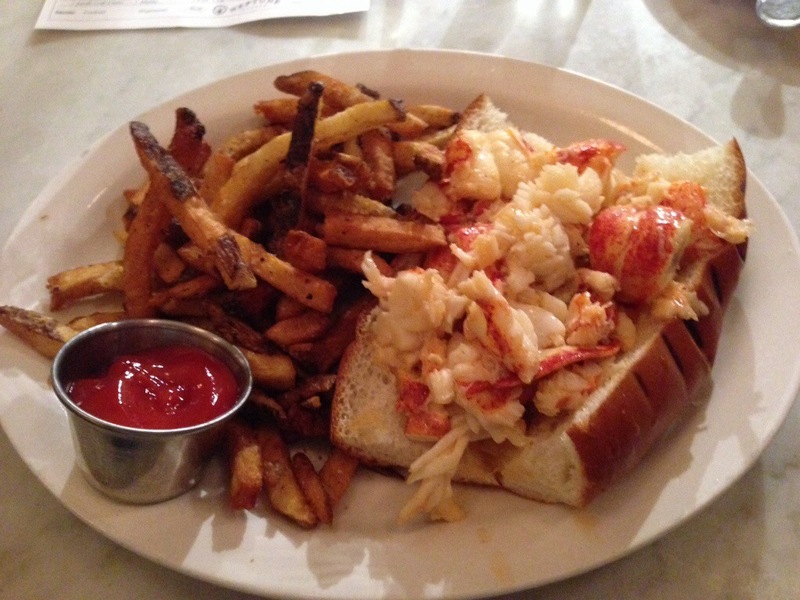 They have a small menu of main courses, I noticed that at least half the customers were tucking into enormous lobster rolls, never to break with the herd I ordered one too. What arrived can best be described as a lobster avalanche. Piles of fresh, perfectly cooked lobster slathered in butter and served with superb skin-on chips. They’ve absolutely nailed the balance of crunch and colouring that so many other places seem to miss. Sat with a pile of oysters, a glass of sharp white wine watching the world go by (and queue outside the window) – there aren’t many better ways to spend and evening. Boston has a small but proud Chinatown. 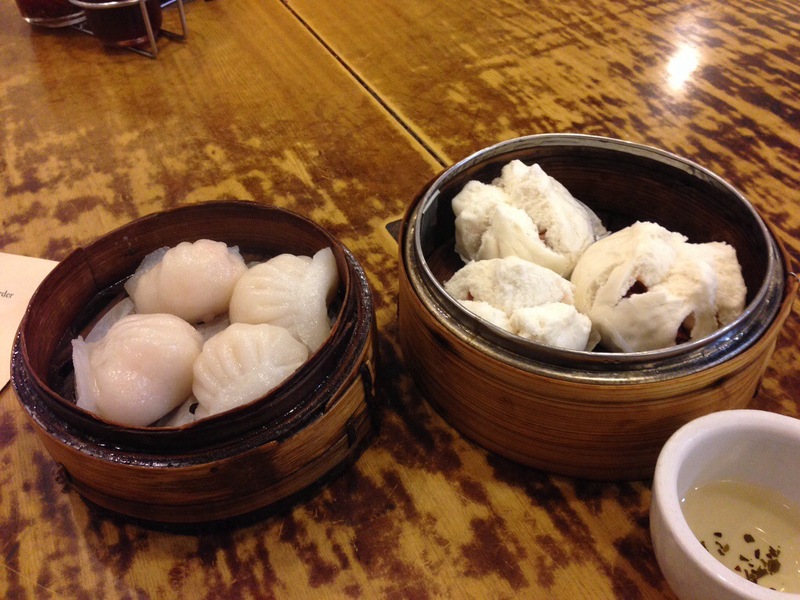 Dumplings are a classic family breakfast treat in many parts of Asia – lonely planet reckoned Winsor did the best. The restaurant itself was very quiet at 9am, but it’s tatty chairs and battered tables were soon filled with hordes of punters. Picking from a laminated, photo menu always makes me nervous, but I shouldn’t have worried. 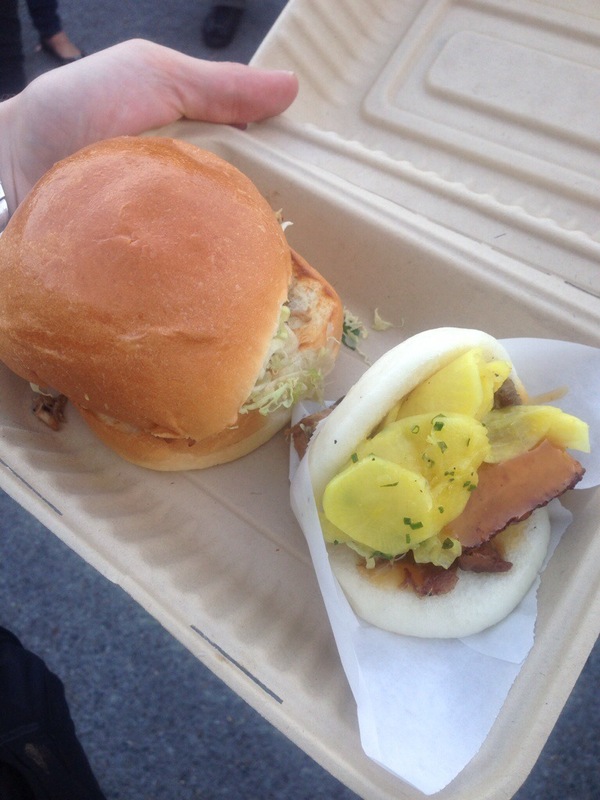 The char siu bao were incredible, pillowy soft and with a rich, porky filling. The perfectly way to start your day. 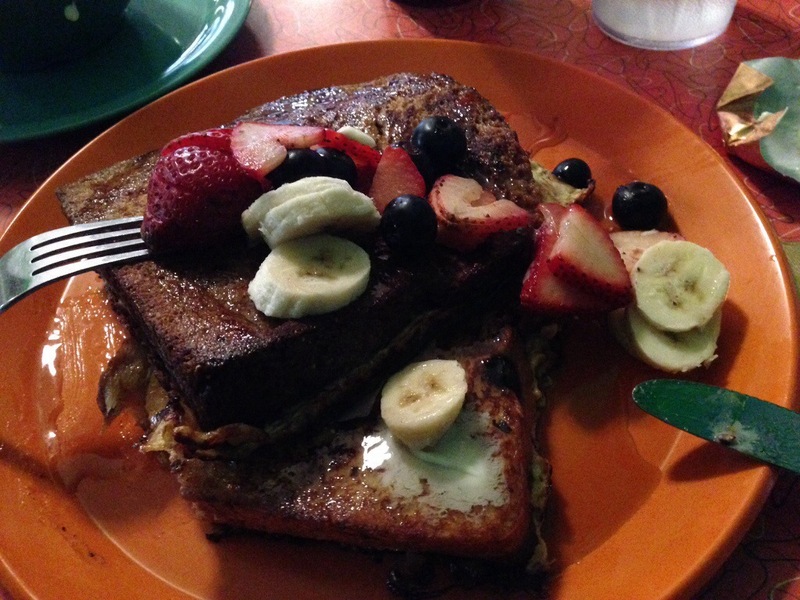 Some people rate The Friendly Toast as one of the best breakfasts in the entire country. 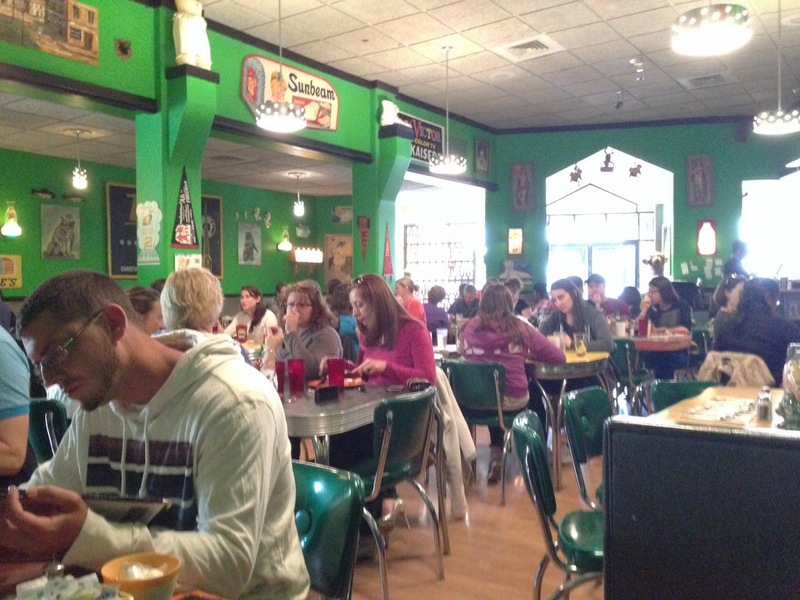 In the heart of the university suburb, it’s a quirky and eclectic diner. The friendly staff are as graffitied and interesting as the walls and they quickly provided me with some excellent French toast with fruit. All the bread is made on-site – I particularly liked their brown loaf, made with lumps of molasses which subsequently melt and provide a lovely darkness. 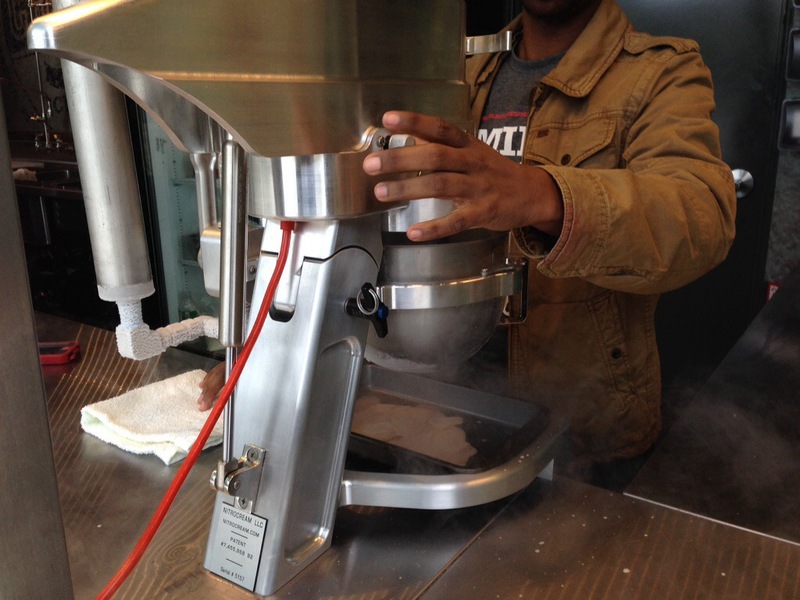 Making ice-cream with liquid nitrogen has become a calling card of the modernist food movement. The theory is simple – the quicker you can chill the ice cream base, the smaller the crystals will be and the smoother the texture. Very few things are colder than liquid nitrogen and it turns a chocolate custard into an ice cream in a matter of seconds. Plus it creates a huge amount of smoke which is always nice. 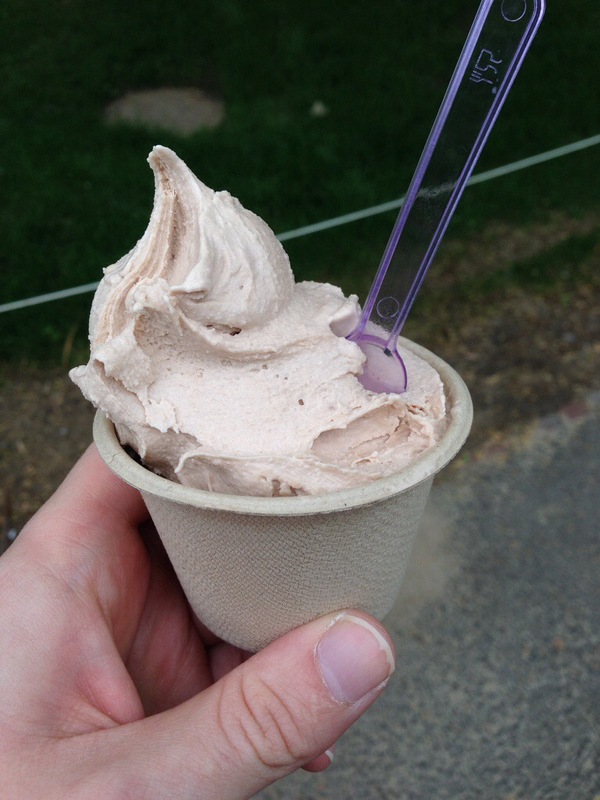 When I spotted a shipping container in Harvard Yard making it fresh for customers, I had to give it a go. 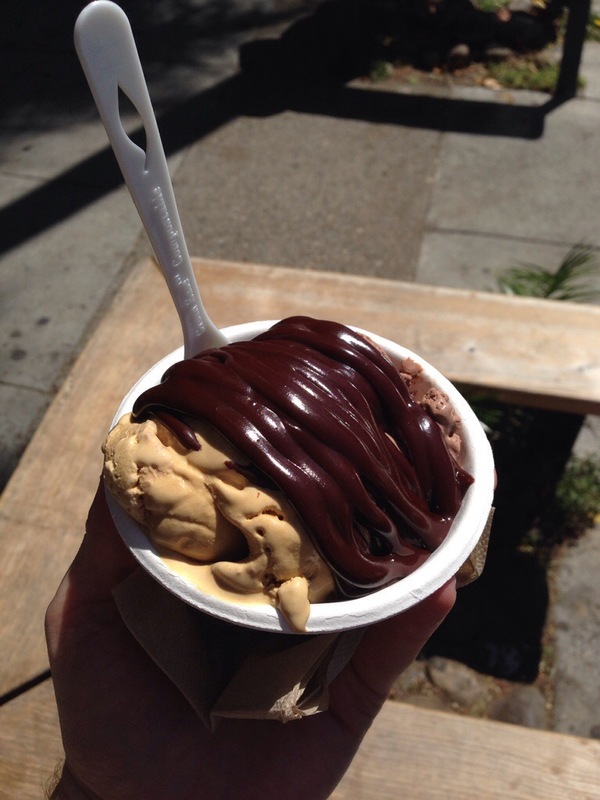 The ice cream was delicious – silky smooth and with a really nice soft texture. They’re shipping a container to London in the next few weeks, so keep your eyes peeled! “The Oldest Restaurant in America” or so claims the sign outside. 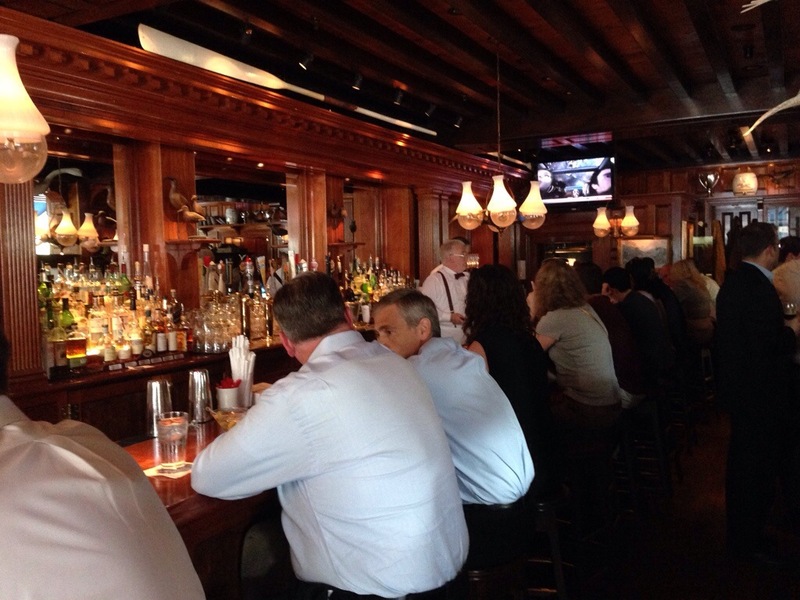 Regardless of its age, Union Oyster House is one of the most popular in Boston. 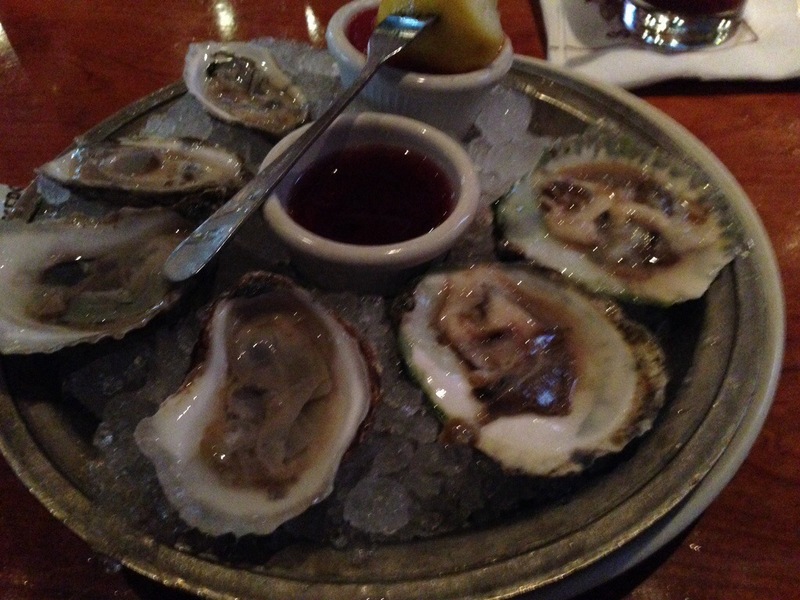 It’s beautiful wooden raw bar is the perfect place to enjoy a Sam Adams and a few oysters. The main attraction for me though was their clam chowder. 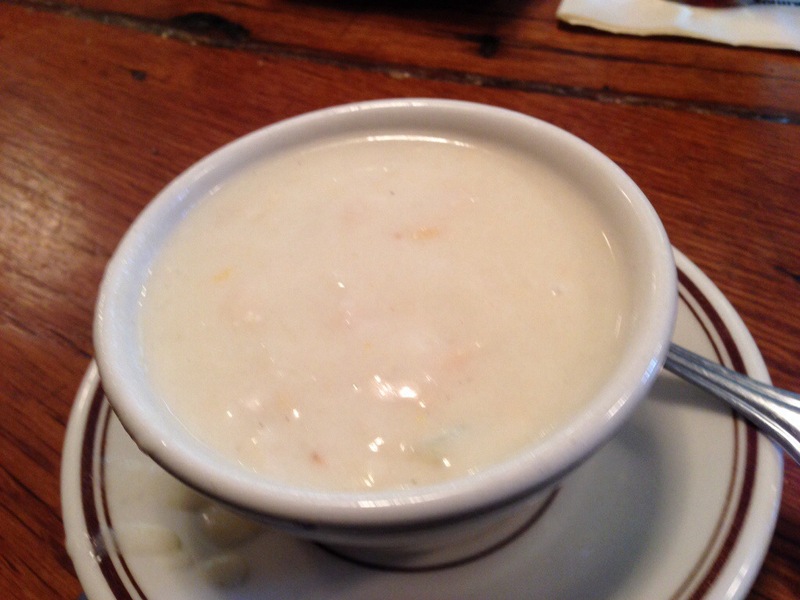 A New England icon – this creamy, seafood and potato soup is legendary. It’s certainly the perfect thing to warm you up after a cold day traipsing along the freedom trail. 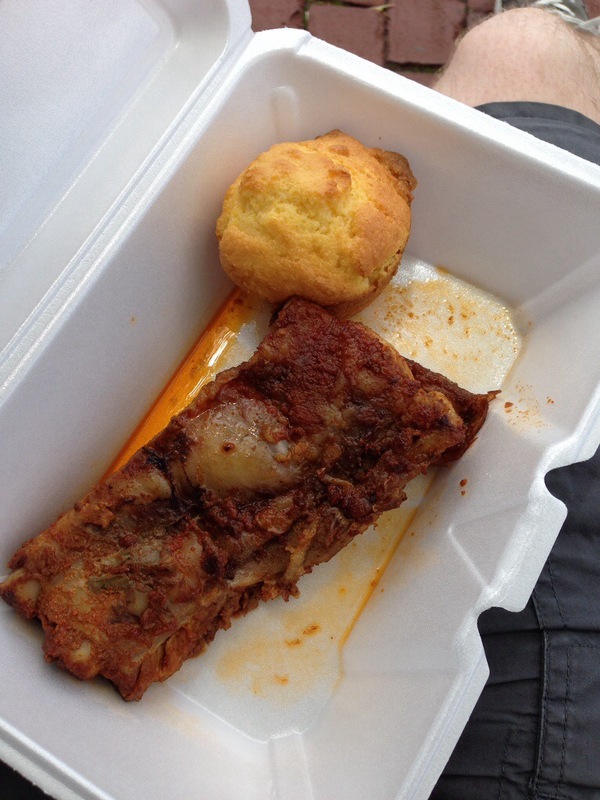 I particularly liked the cornbread it was served with – it added some nice sweetness. When you combine New England’s world class seafood with Boston’s proud Asian heritage, the sushi ought to be special and O Ya do something spectacular. Taking traditional nigiri and sashimi as their base they garnish each piece with throughly modern accents – think squid ink foam and foie gras. Situated at the north end of Chinatown in a beautiful converted building it consists of a lovely bar around the sushi kitchen and a few tables. It’s small and very intimate. The menu is available a la carte or as one of two rather pricey tasting menus. I opted to pick a range of dishes from across the menu. This must be a vegetarian dream – you could blindfold someone and they’d think it was beef – deep, savoury and with a lovely texture. Crispy, fried oysters add some nice texture to a superb bite. There’s so many flavours going on here and they all work beautifully. There’s a final lit hit of wasabi at the end that’s perfectly judged. The foam doesn’t add much to the taste, but it’s beautiful to look at. Fatty tuna, seared with a blowtorch and served with sweet onions and crunch gobo (burdock) and foie gras. It’s soft, buttery, dark and delicate. 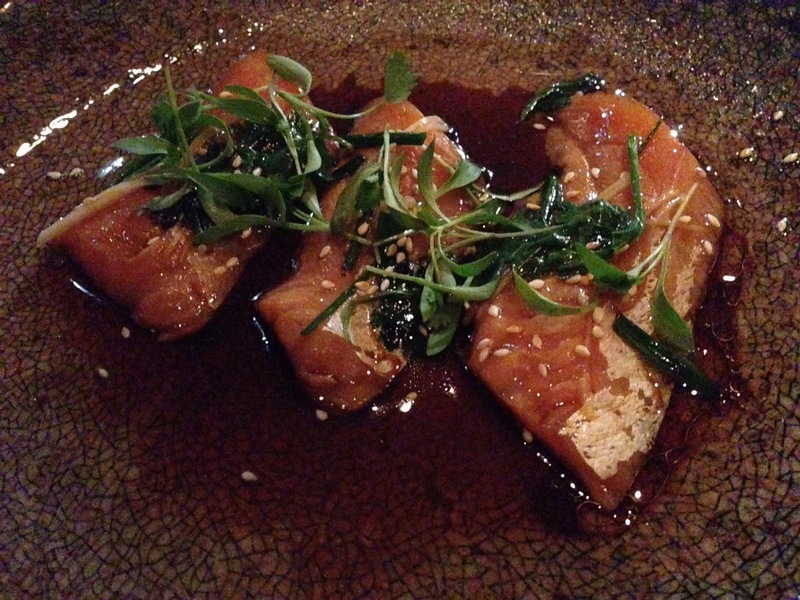 My only sashimi dish – three buttery salmon slices with hot sesame oil and ginger. The fish had heavenly texture and contrasted nicely with the warm oil. 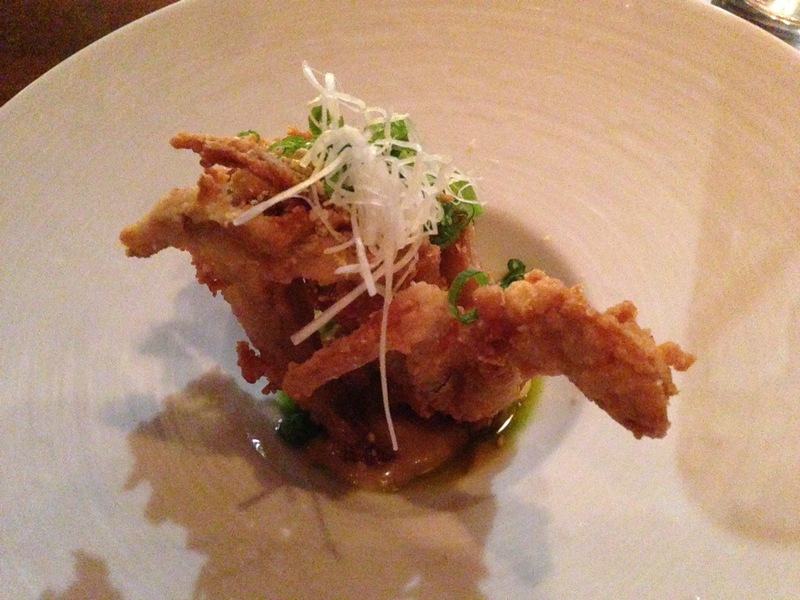 I adore soft shell crab and this must be the best I’ve ever had. Sweet, crunchy and with a clever sharp citrus note. 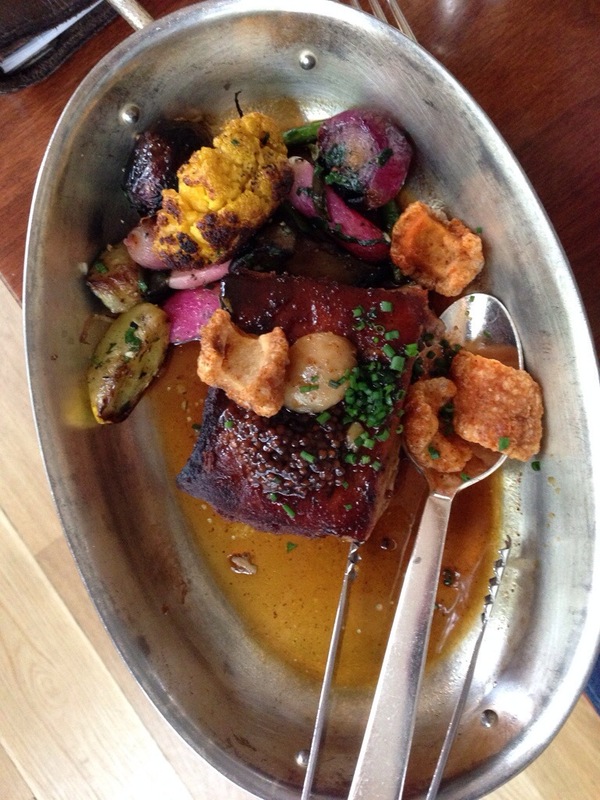 The pork was nicely cooked and with the creamy foie gras made for a very rich dish. The Asian slaw wasn’t acidic, but brought some much needed vegetal freshness. The chocolate had real bitterness, offset by the sweet caramel. Foaming it was very clever, it stops it being too sickly or heavy. Little sesame and salt flakes added crunch. The meal finished with some beautiful chocolate. 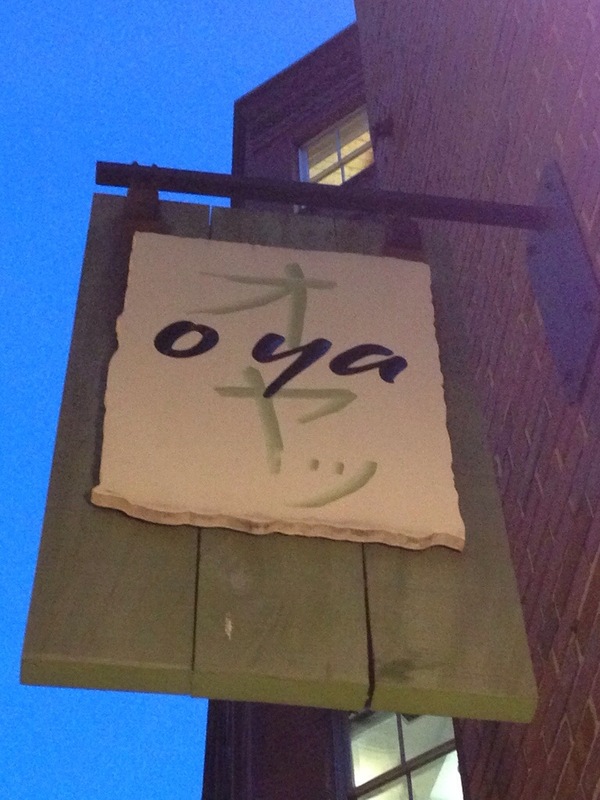 O Ya is certainly not cheap, but the raw ingredients are incredibly good, the cooking is superb and they do something entirely unique. I’ve never had such good fish – every bite was incredibly complex, but managed not to smother the flavour of the main ingredient. Balancing two or three flavours is impressive, doing it with six or seven is just incredible. It’s got to be one of the best meals I’ve eaten this year. America is a melting pot – of ideas, peoples, cultures and food. This is especially true of its capital – designed from scratch to be the seat of government for a world power. With representatives from every state and territory, a close connection to the South and the Atlantic coastline on its doorstep, DC does everything when it comes to food. In a brief three day visit I did my best to sample some of the highlights. I am firmly convinced that jet lag, like seasickness, is a state of mind. What better way to distract yourself from the fact that your body clock is totally out of sync than cocktails, seafood and steak. 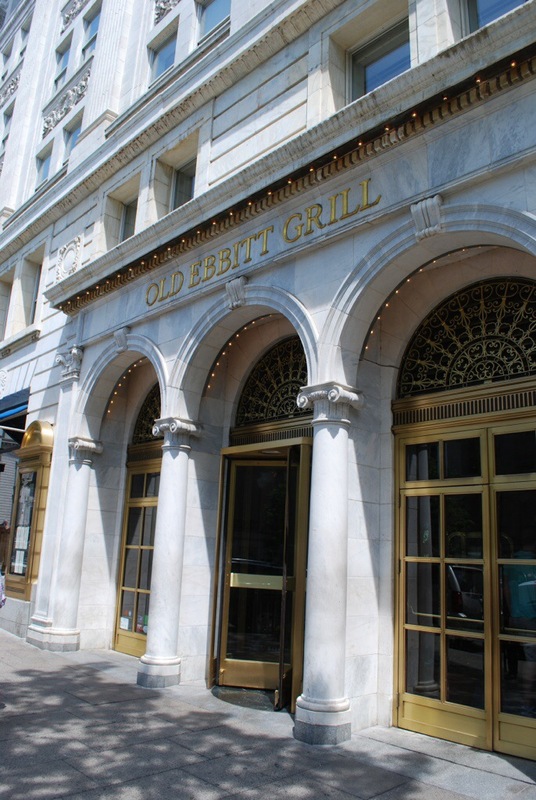 Opposite the White House and the Treasury, the Old Ebbit Grill is a Washington institution. There’s shot guns on the wall, wood panelling, stuffed pheasants and big comfy leather chairs. The staff are the kind of slick, well drilled hosts that wouldn’t bat an eyelid if Obama walked in. Sat at the enormous bar with a superb cherry mojito (crafted, incidentally, by a Glaswegian) it’s great fun to watch the hustle and bustle of politicians, locals and star struck tourists milling around outside. Oysters have a very different status in America. Whereas in the UK they’re expensive and exotic, in America they’re a commodity. Readily available in DC, you can walk into any restaurant and order a dozen for a few dollars. But much like on the west coast, quality costs and provenance is everything. I sampled six oysters from three different bays along the East Coast – each with their own distinct shape, texture and flavour – all wonderful. Next up is the key to my jet lag cure – an enormous hunk of steak. USDA Prime New York Strip (a piece of sirloin, from towards the front of the cow). Americans take their beef very seriously and with good reason. The government grading ensures a consistent quality and the standard is high. Because of the breed and the diet, it tends to be sweeter and softer than British beef, though without the fragrant buttery hit you get from grass finished cattle. 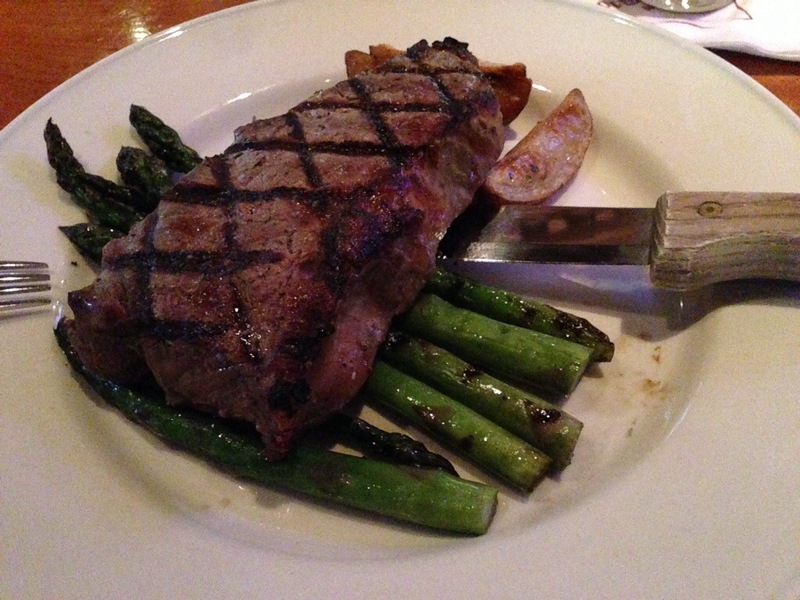 This example was beautifully cooked and I liked the charred asparagus – it’s adds that missing grassiness back in. 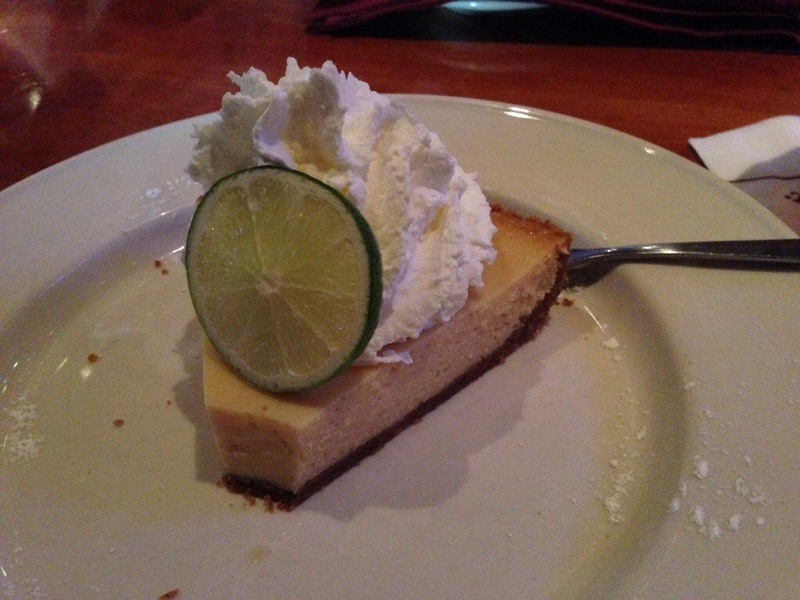 Dessert was a key lime pie – acidic, sharp and the perfect end to a meal. After a good feed, the barman suggested I visit the rooftop cocktail bar at the W hotel over the road. With views across the National Mall and the White House, it was an excellent shout. I also tried another iconic bar just around the corner. 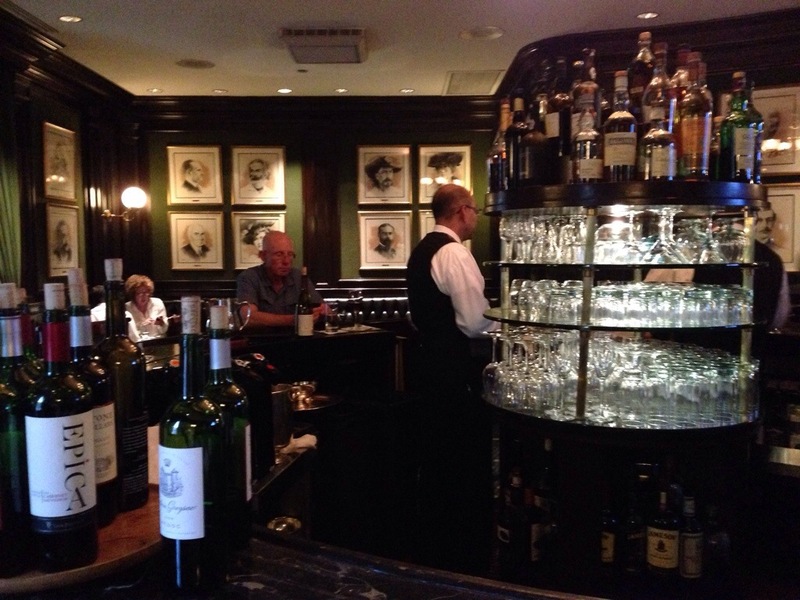 The Round Robin bar is just that – round and is where political lobbying in America was born. They have an excellent whisky and beer list – which can only help grease the wheels of the political machine. There’s no denying that America has access to some incredible ingredients, but there’s also a lot of mass produced and imported products that are guaranteed to disappoint. Organic and ethical restaurants are popping up everywhere and Founding Farmers is one of the first. I had an excellent chef salad – half a fresh, crunchy lettuce festooned with cooked meats, creamy sauce and heavenly cornbreads. 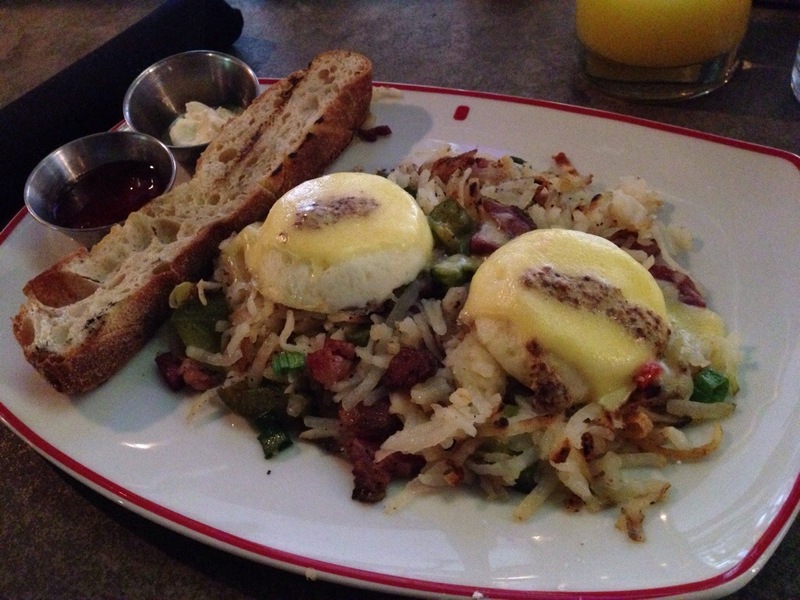 I popped back for breakfast the next morning and was even more impressed – their pastrami hash was a world away from the plastic McDonalds potato puck. 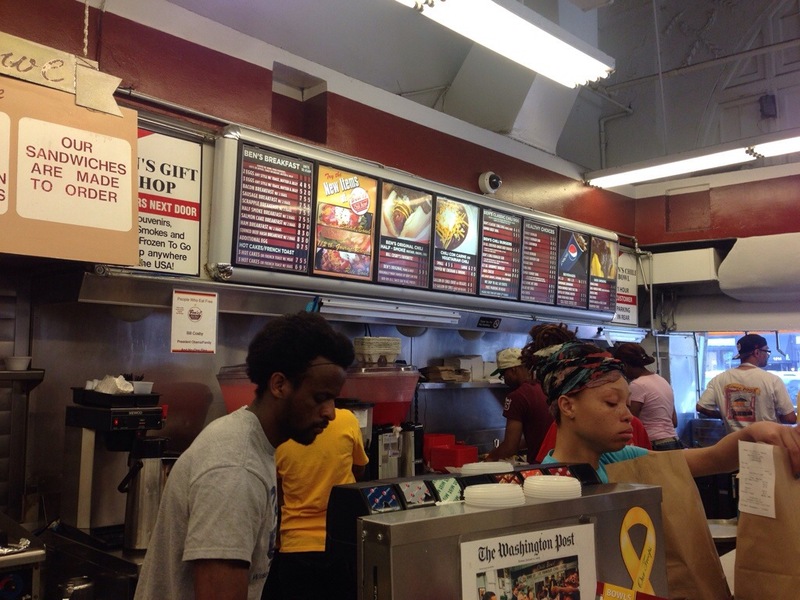 A Washington landmark and cultural touchstone – Ben’s has been serving chilli for fifty years. Their signature is a half-smoke, the DC version of a chili dog. I’m always slightly nervous about eating at such famous places, often they’ve just become tourist traps trading off an iconic name. Thankfully Ben’s lives up to its billing. 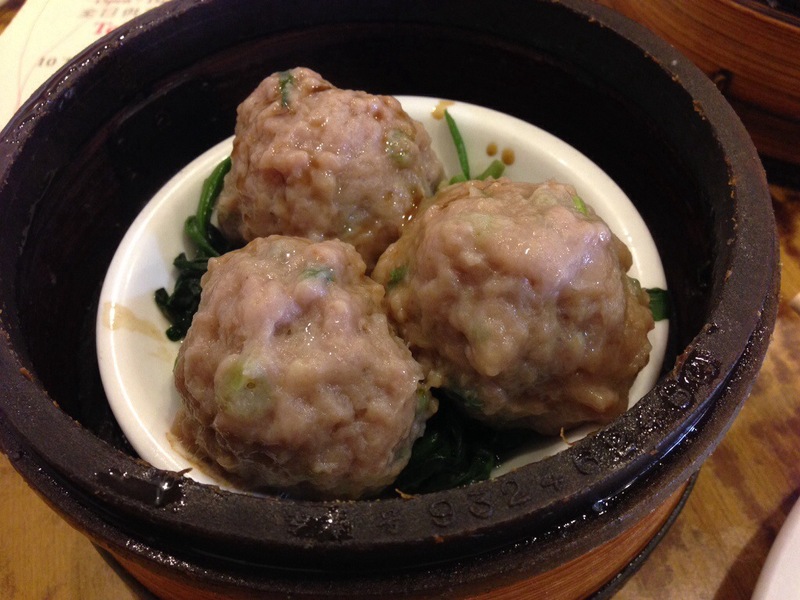 The sausages are fantastic quality – half beef, half pork and coarsely minced. The chili is superb – true to the American rule, not a kidney bean in sight. There’s no overbearing tomato flavour, just a gentle beefy sweetness and a lovely smokey heat. They also deserve commendation for their lemonade, by far the best I’ve tasted. DC shares a border with Maryland and through them has access to some of the best seafood on the East Coast. 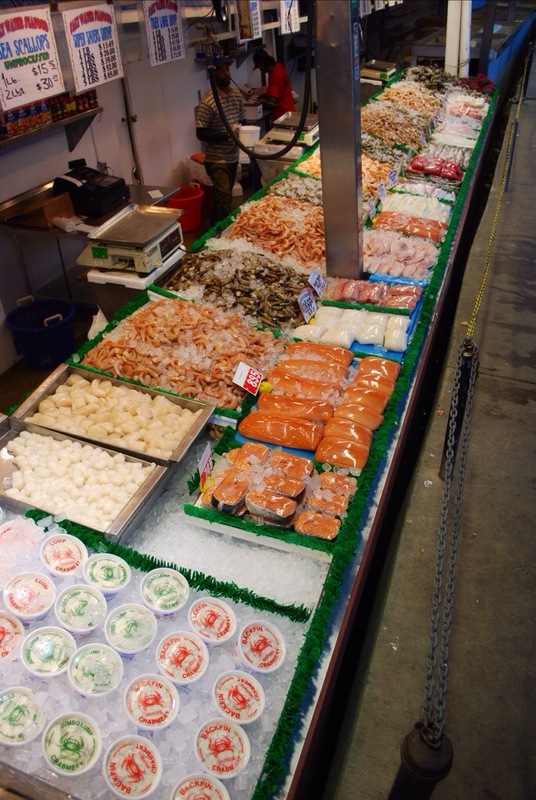 Maine Avenue Fish Market is where locals go to get their fix. Enormous stalls carry every kind of fish imaginable which they’ll happily grill or steam for you right then and there. I had a plate of frankly enormous clams and a box of superb shrimp. Both fresh, both very tasty. Pulled pork has almost become a staple food in the UK, you can buy it in sandwiches at Boots, however I’ve never seen a pulled pork pie. This was heavenly – soft, meaty and with a brilliant spice rub. Too often in the UK we bury the pork in sauce and shred it into oblivion – this had texture and sharp smokey flavour. They also offer a couple of local hot sauces which were the perfect accompaniment. 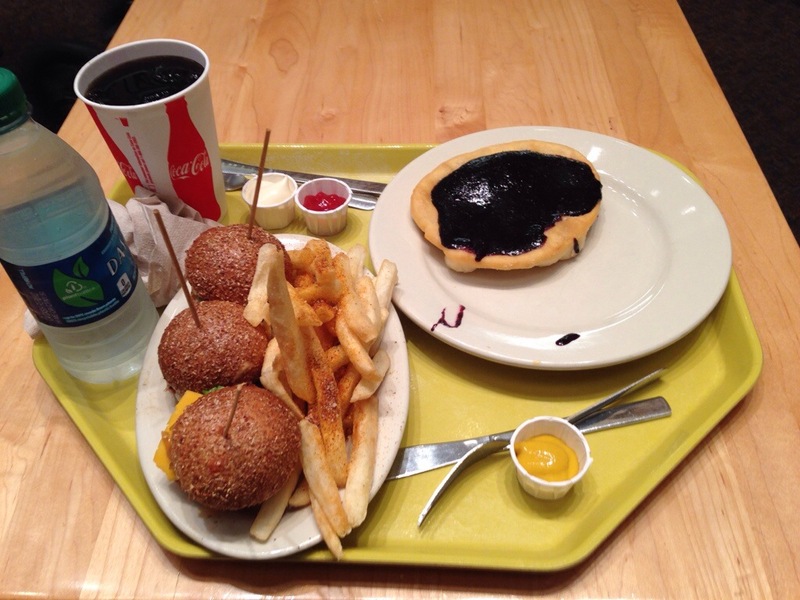 Museum food in DC is nothing to sing about – bland cafeteria fare and Starbucks. That is unless you go to the Smithsonian Museum of the American Indian. Their “Mitsitam Cafe” has won a slew of awards and published a very successful cookbook on the back of their native influenced food. 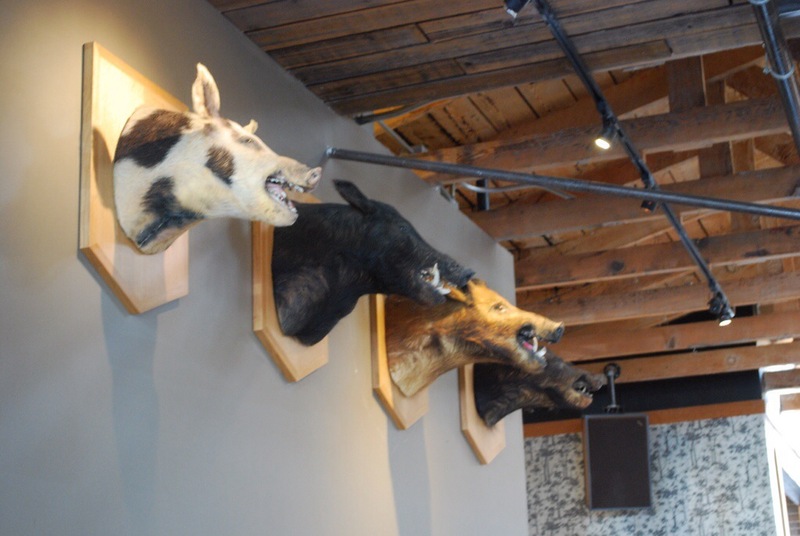 They offer a range of traditional Central and Northern American dishes – I picked a set of three sliders showcasing flavours from the north-east. The turkey was nice, the duck/beef delicious – but the real star was the Elk burger: rich, firm and gamey. For dessert, corncake with native blueberry compote was lovely – buttery and sharp and very more-ish. We’ve already talked about the importance of provenance in modern American cooking and Blue Duck Tavern have taken that concept to the extreme. Every dish on their menu clearly states the producer and state for the main ingredient. They offer a range of dishes showcasing the best of American food. 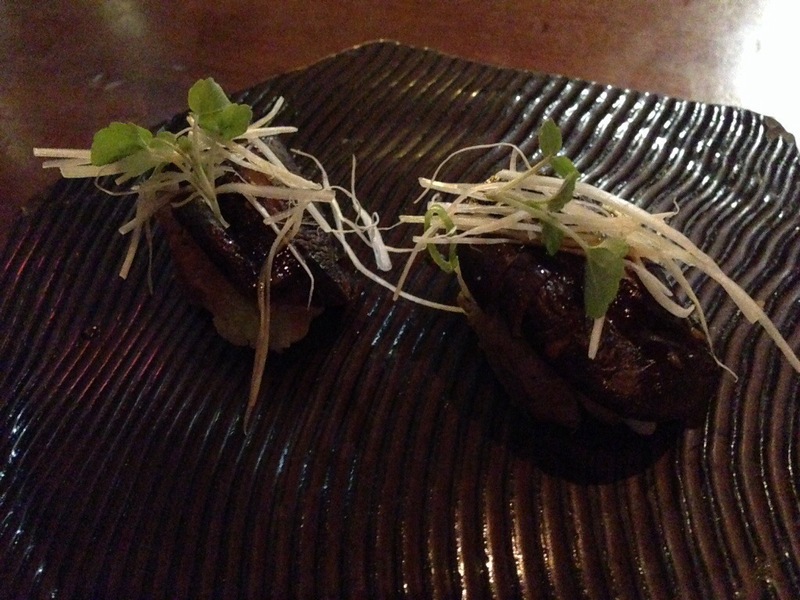 I had a delicious wagyu tartare – Americans go crazy for this Japanese style beef. It’s incredibly soft, but doesn’t have that intense beefy taste you get with the best British cattle. A fresh salad and sous vide egg are the perfect accompaniments. Just cooking the yolk is very clever – it not only makes the dish safer, but improves the texture – creating a hot, savoury custard. For the main I had roast suckling pig – perfectly crisp skin and soft, sweet meat underneath. 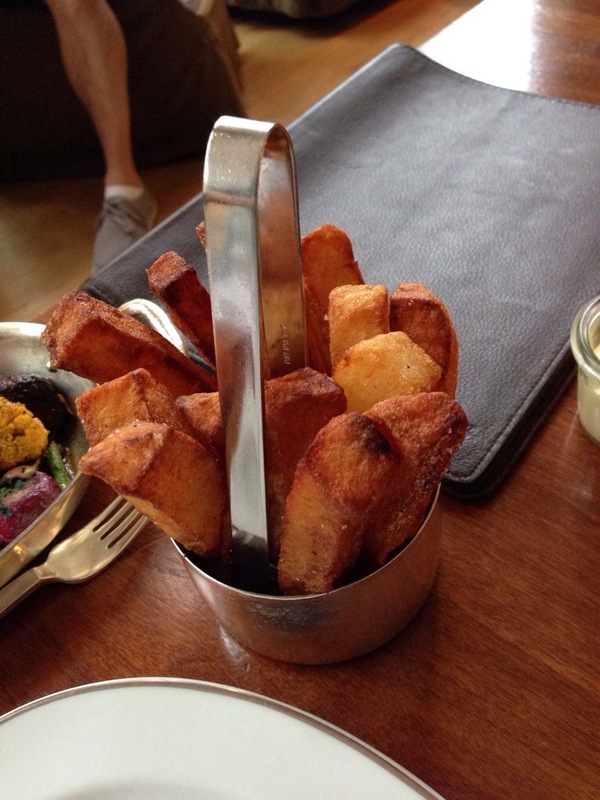 I also ordered a side of triple cooked chips – these had fantastic flavour, but the texture wasn’t quite right. Either they didn’t dry them properly between cooking stages or the moisture content was off in the original potato. 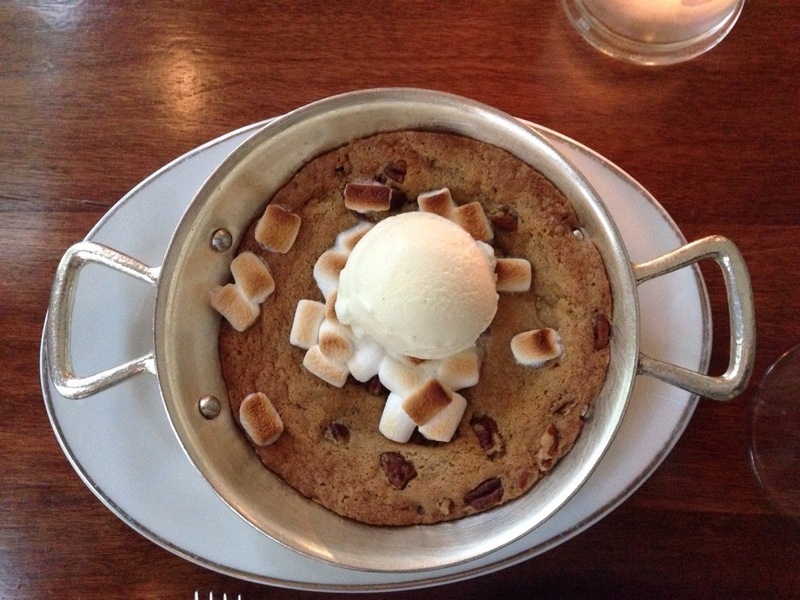 Dessert was much better – a lovely warm cookie dough, ice cream and toasted marshmallow. It would be a really easy dessert to do at home. Washington is a great place to spend a few days – it’s got world class museums and galleries, fantastic food at every price point and some of the best tourist sites on the East Coast. Bristol is full of water – not just when it rains (which it does constantly) but due to it’s river and harbours. Theres all sorts of floating establishments, but easily the smartest is Glassboat. It’s an impressive sight with gorgeous floor to ceiling glass windows in its aft section. The menu is very modern European – there’s pressed pig cheeks, pigeon, smoked trout, tuna carpaccio and all manner of other tempting delights. A starter of scallops, charred romanesco and bayonne ham was very good. 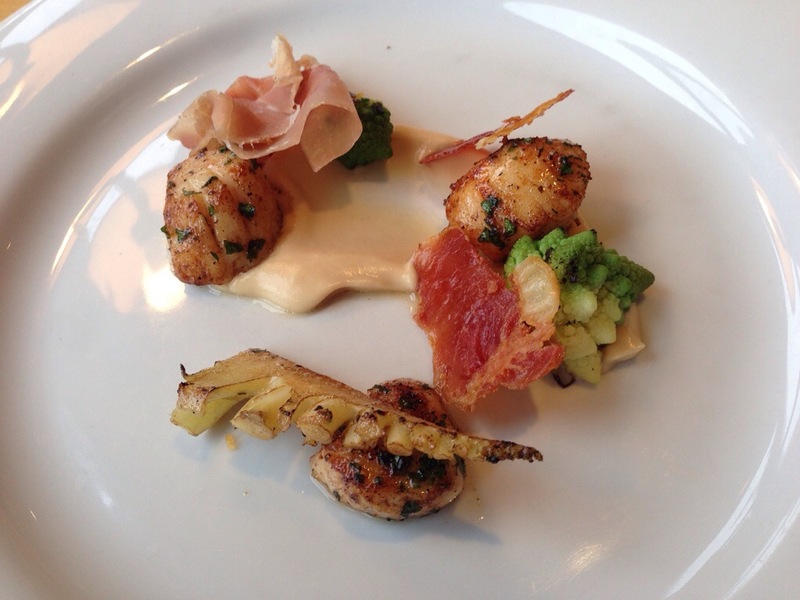 The delicate scallops well cooked and perfectly matched with the creamy brassicas and salty ham. Pigeon breast ballontine was very neatly done – gamey and rich, offset with the kind of sharp red cabbage coleslaw that’s guarenteed to make your mouth water. Beef fillet, jacobs ladder, broad bean puree and truffle was equally good. 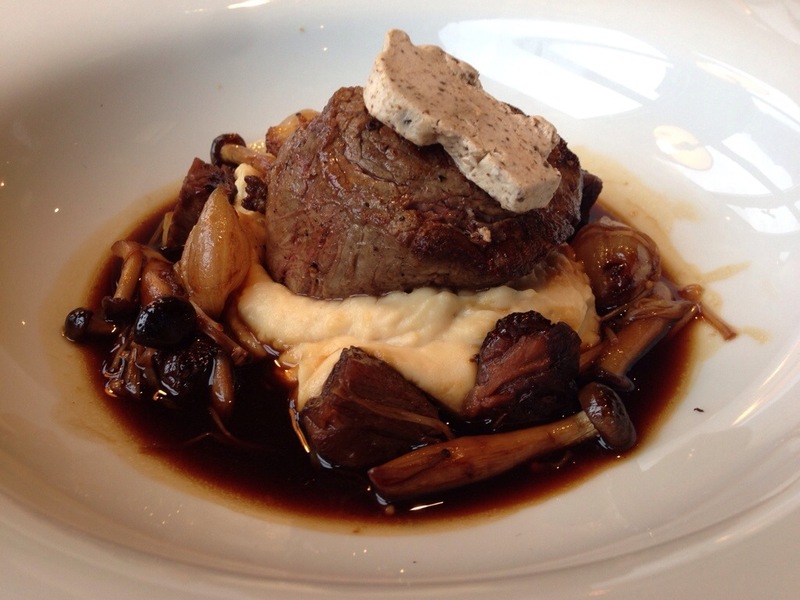 The contrasting beef is a nice idea and the bean puree was inspired. The truffle butter needed a little more finesse, rock hard and incredibly pungent. I adore truffle and still thought it was a little heavy handed. Canon of lamb with sweetbreads, peas and broad beans continued the strong meaty theme.The offal heavenly and light, the fresh green vegetables underlining their delicate flavour. 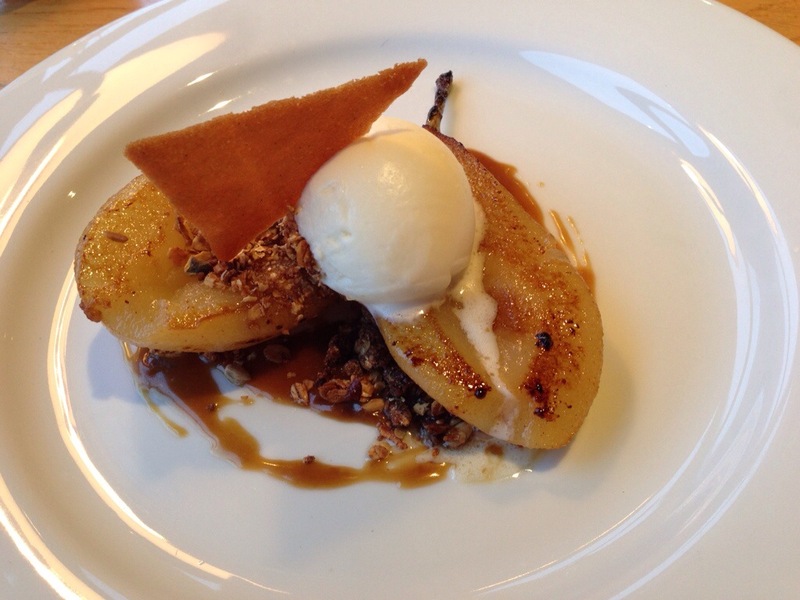 Some poached pears with spiced granola were a pleasantly warming finish to the meal and ginger ice cream made a really nice tart accompaniment. Lemon parfait with ginger shortbread and meringues showed some excellent pastry work. The parfait nicely set and with a healthy citrusy hit. A very good end to the meal. 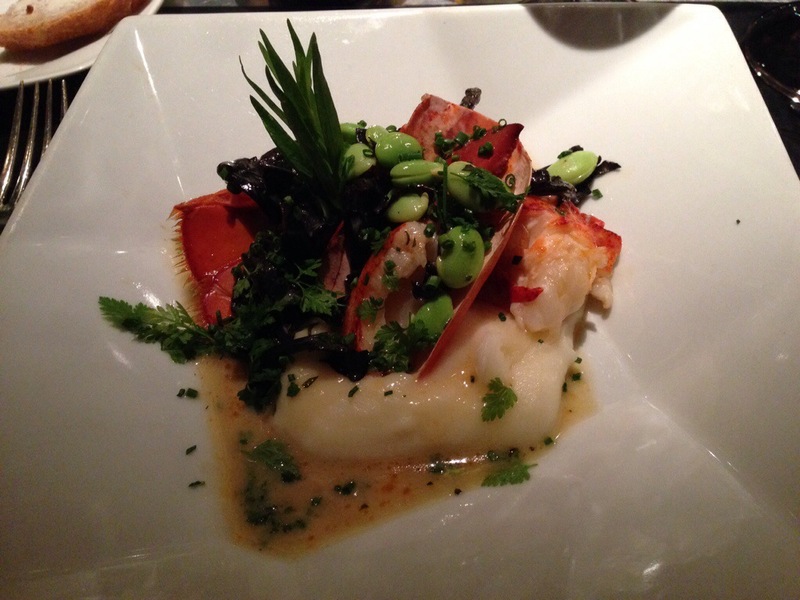 Some ‘feature’ restaurants fail to live up to their surroundings, but Glassboat really do deliver very good food. Sitting out on the water, sipping on a good glass of red wine and watching boats meander past is a great way to spend an evening. The service was prompt and friendly – comfortably dealing with a busy Wednesday night. Definitely worth a visit. Italian food is so much more than pizza and pasta. Eating Pizza outside Naples or Rome is like grabbing a pasty in Newcastle – it’s just not authentic. Italy is full of wonderful local dishes that speak of the people that invented them but these regional subtleties are lost on arrival in the UK. Every high street in the country has a chain Italian pumping out nondescript pasta and pizza. Bocca di Lupo aims to set the record straight, offering an incredible range of delicacies, all carefully linked to particular areas – it’s an edible Italian lesson. The restaurant itself is comfortably central – a few minutes from Piccadilly Circus. The interior is focussed around a wonderful open kitchen with a vast marble bar where you can sit and watch the team work. It strikes a lovely balance between casual and formal, you could rock up in a suit or a t-shirt and feel perfectly at home. The menu is split into a range of categories: raw, fish, stews and so on. The food is served tapas style and I like that for many dishes they offer both a small and large portion. With a bottle of lovely barbera in hand we set off for a happy jaunt around Italy’s finest food. To start we had a wonderfully spicy ‘Rosamarina’ – fermented fish with chilli. It was hot, savoury and very very good. The next dish was an “artichoke alla giudia”, an Italian-Jewish staple. It’s an artichoke, lightly crisped in a fryer and thoroughly delicious. Fried salt cod with courgette chips was surprisingly restrained on the salt front – with really good texture in the fish. I’d have liked a little more colour in the batter, but it was still nicely crisp. Rabbit orzotto had a fantastic gamey, rich stock – perfect with the delicate meat. The orzo had a really nice texture, just enough body without being overly stodgy. 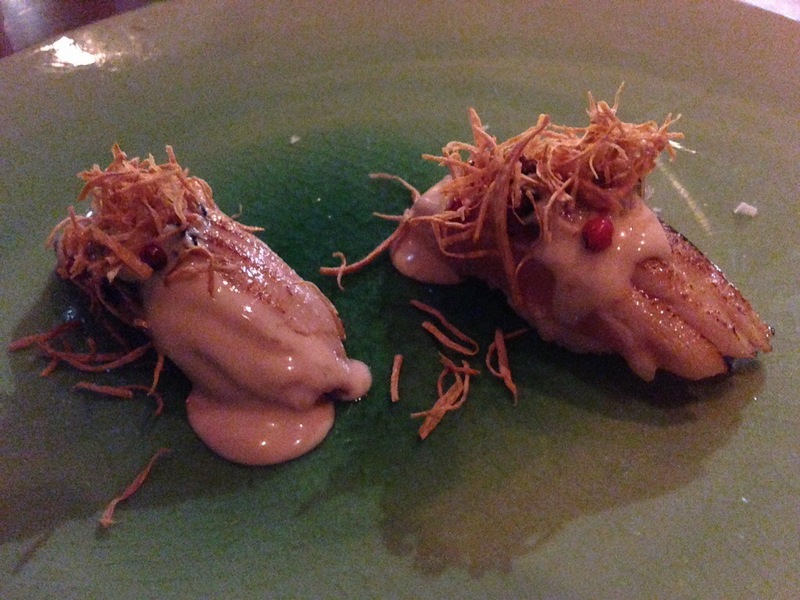 For me, the star of the meal were the skewers – lamb sweet bread with artichokes on chilli bruschetta. Perfectly grilled, wonderfully balanced and totally unique. Heaven on a stick. 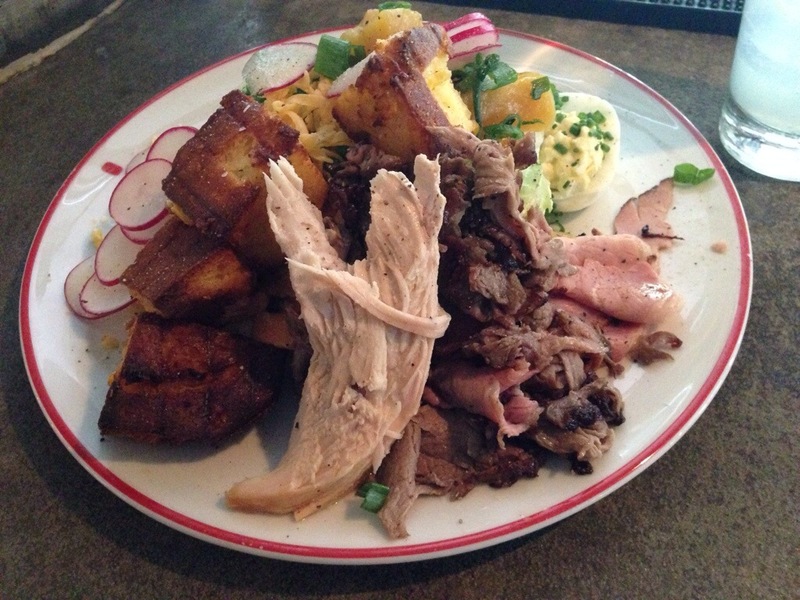 I’d heard a lot of people rave about their roast suckling pig – it lived up to expectations. Fantastically crispy crackling, gooey soft pork and a lovely simple sauce. I was less sold on the chestnuts – they just didn’t fit from a flavour or texture perspective for me. A welcome side of asparagus, gently cooked and doused in lemon juice helped round out the meal. Some lovely roast potatoes – finished in a frying pan, which is definitely a trick I’m stealing – and a Coratella finished the mains. It’s a rich lamb stew made from most of the insides of the animal. I loved it, but those less fond of offal might struggle with the minerality. Dessert was a triumph, a trio of perfect profiteroles, filled with silky smooth gelato – the sour cherry and ricotta was especially good. To finish the meaty meal we also had a “sanguinaccio” from Calabria, a sweet chocolate pate, set with pigs blood. It’s really good, the blood just adds a gentle savoury note. If you told someone it was Nutella they probably wouldn’t notice the difference. Pine nuts and mixed peel are a great touch. 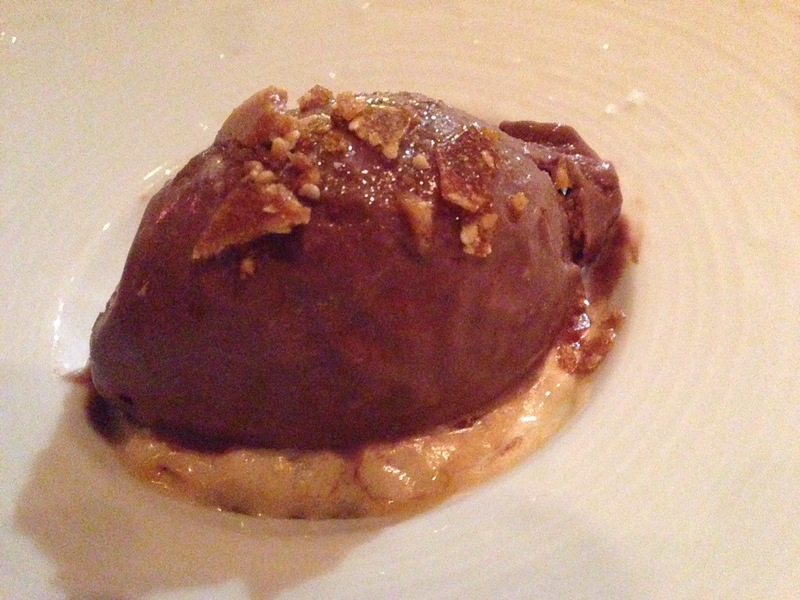 It was a fantastic meal – I loved the chance to explore the full breadth of Italian cooking. 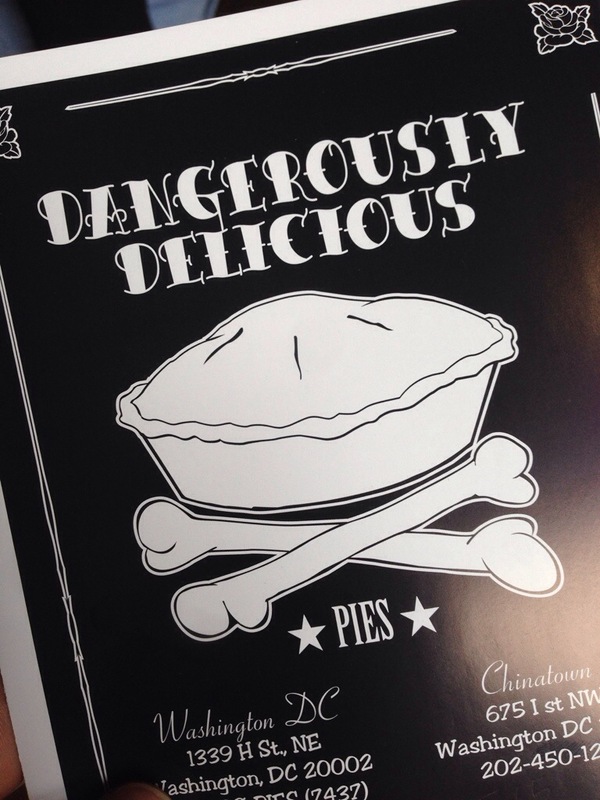 Great ingredients, carefully prepared and the open bar adds a healthy dose of theatre. The staff were chirpy and happy to guide us (and put up with our frequent requests for yet more food). While it can get expensive very quickly, it’s absolutely worth it. Forget Prezzo, Zizzi’s and Bella Italia (shudder), this is the real deal. Bring an appetite! Some visits to restaurants are spur of the moment – a sudden urge for Pizza Pilgrims or Chicken Shop results in a regular detour for me. Others are more carefully planned – carefully researched and booked months in advance. With that comes risk as expectations are sky high and restaurants need to do something really special to meet them. I’ve been desperate to go to The Ledbury for years, alongside it’s two Michelin stars, it’s many ‘Restaurant of the Year Awards’ and it’s lofty place as the 13th best restaurant in the world – it’s most people’s pick as the best in London. Many moons ago that title rested with Marcus Wareing at the Berkley and my visit there was very special, does the Ledbury live up to the hype? Situated in a quiet corner of Notting Hill – the Ledbury is relatively unprepossessing, a single restaurant on an otherwise residential street. The décor is smart but relaxed – lots of natural light floods the room and there’s no dress code. Opened in 2005 it’s covered itself in glory ever since. Brett Graham, the Australian head chef is my kind of cook – precise, passionate and with a healthy appreciation for quality British produce, preferably the kind you get to shoot. As it was a special occasion we had their tasting menu, they also offer a four course a la carte menu and a very reasonably priced set lunch. A wonderful selection of little bites started the meal, all beautifully presented. 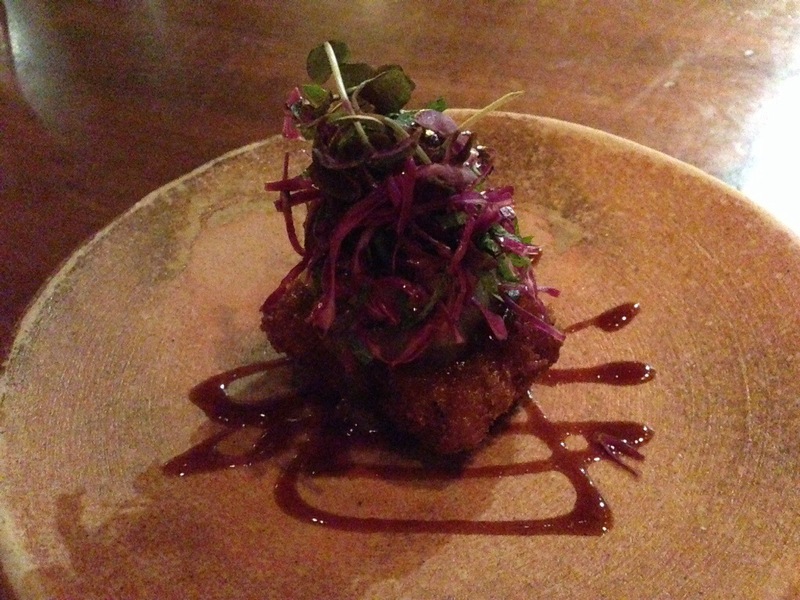 Apple and raw fish is a good combo, but the star was the little deep fried brawn cubes – crispy, warm and deeply piggy. The bread was also excellent: sourdough, bacon brioche and a crystallised malt – freshly made in house. This was very much a textural tour de force – crunchy artichokes and hazelnuts, soft melting duck and frozen buttery foie gras. Magical stuff. One of their signature dishes, and with good reason. The mackerel is absolutely perfect, delicately charred on one side, blushing pink on the other. The pickled cucumber was dainty and delicate while the gentle hint of shiso, an asian mint, just underlined the oily fish. It’s easy to overdo a dish like this whereas the fresh, sweet flavour just sang. Curds are the beginnings of cheese and the combination of soft, melting dairy with hot sweet onion is always going to be a winner. Enoki mushrooms and the truffle toast add a nice savoury element. A monstrous scallop, perfectly cooked and slashed with shreds of seaweed. 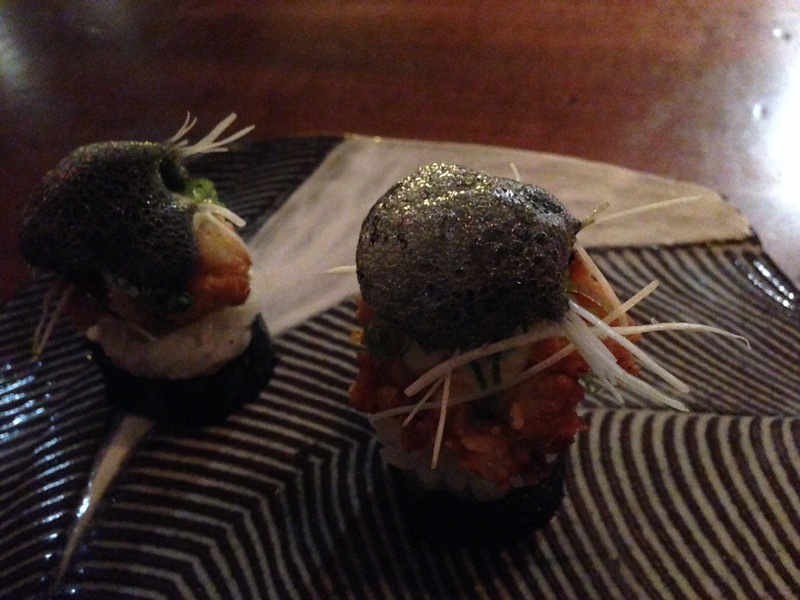 I particularly liked the cauliflower and romanesco – its a clever match with the delicate fishy flavour. Perhaps the only slightly duff note in the menu – still perfectly executed, but I didn’t quite get the rich, smooth mashed potato with the wonderful, but very lonely, morel. I’d have happily eaten an entire bowl of the mushrooms, keep the spuds away from it! Another piece of precision cooking, meltingly tender beef with a delicate savoury sauce. The turnips really benefitted from their salt bake, firming up nicely. They had a good cheese selection, though nothing on the monumental board at Le Gavroche – they were happy for us to share a plate and the five cheese we had covered the bases nicely. Light and refreshing, without the acidic kick you get from some pre-desserts. The blood orange granita was admirably smooth without any harsh, crunchy bits. The tart was beautifully put together – delicate pastry, chunky banana and rich smooth chocolate dusted with little bits of honeycomb crunch. As a birthday treat we got an extra course – a fabulous sugary tart with a subtle ginger ice cream. The perfect end to a four hour lunch: a strong coffee and some lovely sweets. 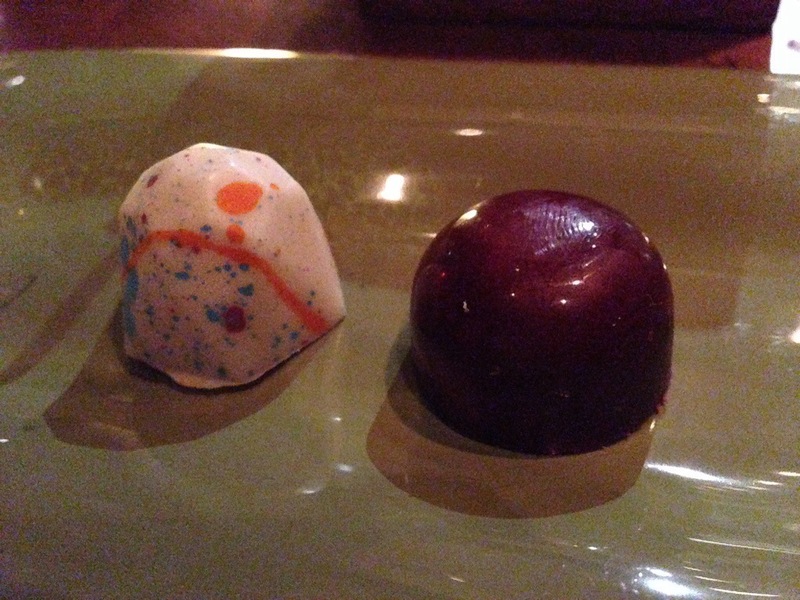 Light crunchy biscuits, soft fruity jelly and one of the lightest truffles I’ve ever had, nestled on a bed of cocoa nibs. Heavenly. Throughout the meal the staff were fantastic, far friendlier than in many starry establishments and happy to chat about the food and offer advice. Despite it’s international reputation it’s managed to maintain that spark of a neighbourhood restaurant. If I had to sum up the food at the Ledbury in one word, it would be ‘precise’. There are no massive flavour fanfares, no wacky combinations or fads. This isn’t a culinary rock concert, rather a gentle symphony, flawlessly played. The menu really flows through the individual dishes. Flavours are delicate and elegant, beautifully presented and well thought out. It’s modern haute cuisine at it’s very best.